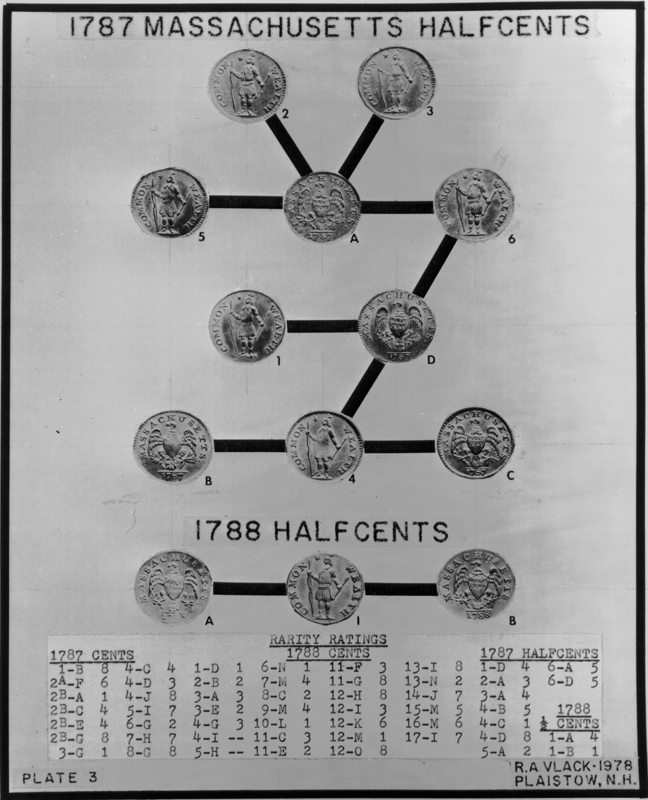 Below is a quick reference listing of the various die variety charts currently available in the Colonial Coin webside. 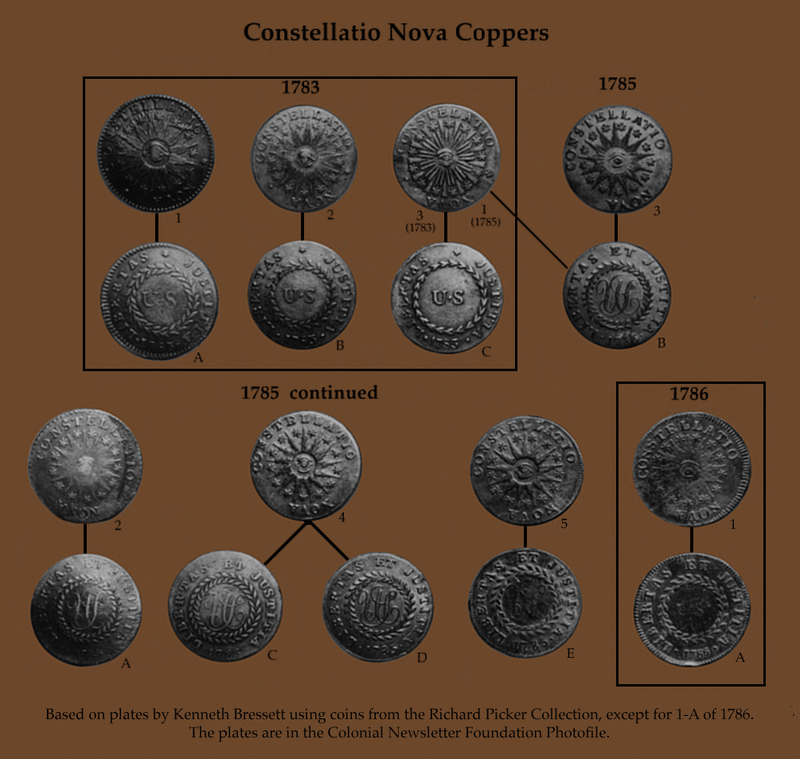 Through the Photofiles at The Colonial Newsletter Foundation Jim Spilman has provided copies of Constellation Nova die charts produced by Kenneth Bressett from coins in the Richard Picker Collection. 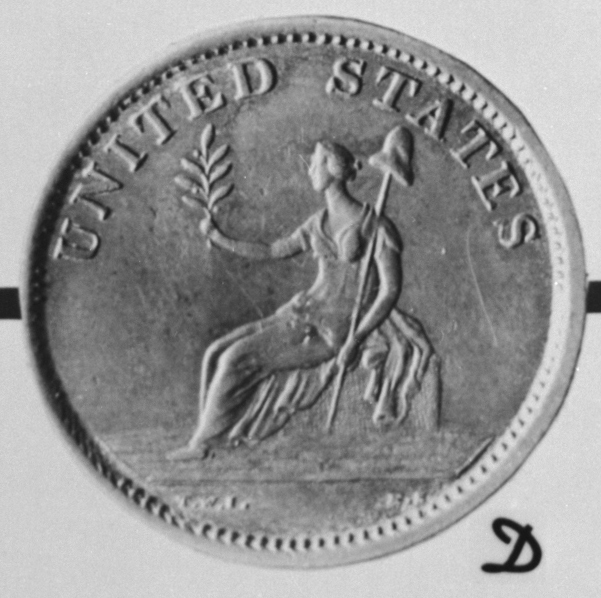 Both versions used the same colorized coins but with different backgrounds. 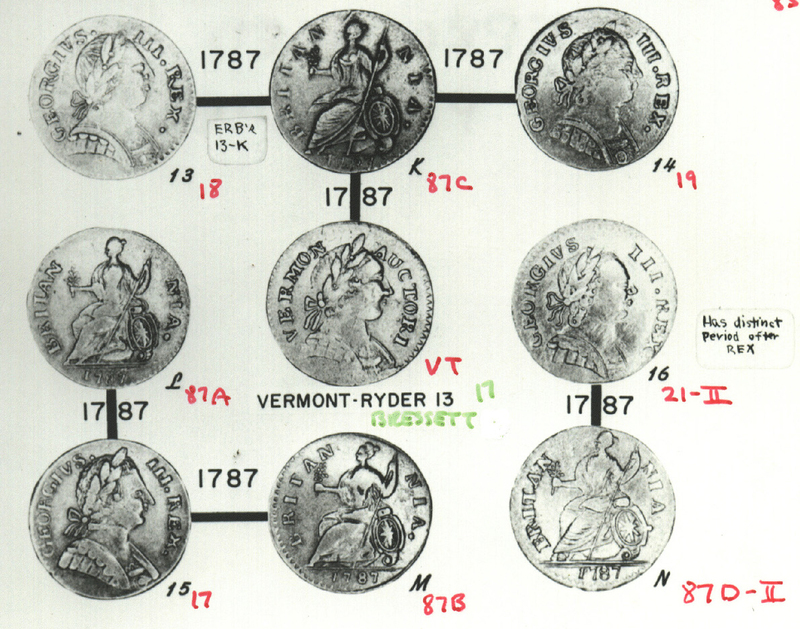 Through the Richard Picker Photofiles at The Colonial Newsletter Foundation Jim Spilman has provided copies of the Richard Picker Vermont die charts which were used by Kenneth Bressett. 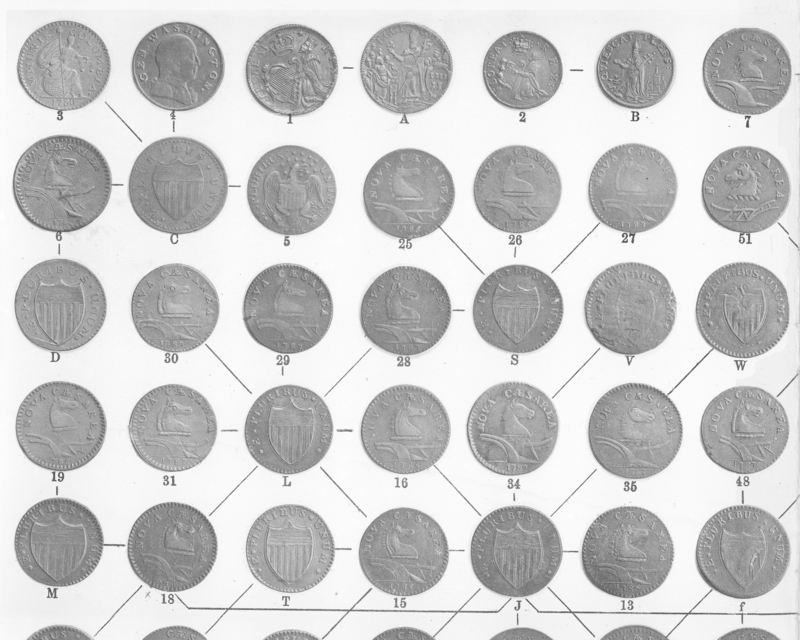 Jim Spilman has added the ligatures showing the various die relationships and I have redistributed the images and added related imitation halfpence from Vlack's plates to display the full interrelated die groupings. 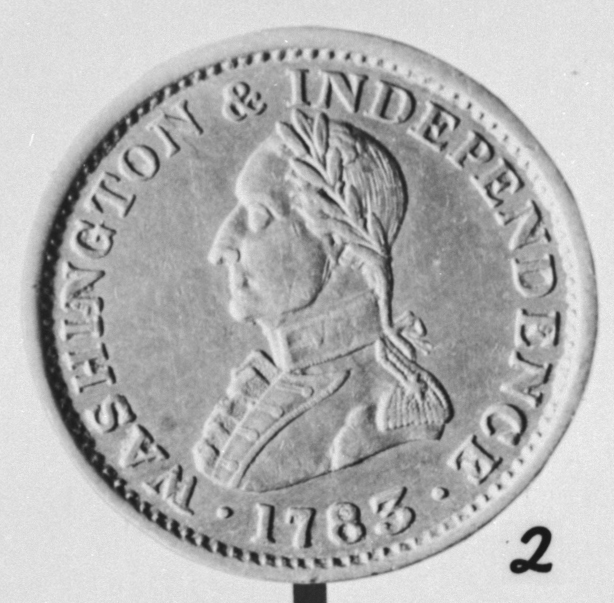 The Ryder-Richardson coin designation is listed above the combination while in the lower right is the Bressett obverse number or reverse letter. 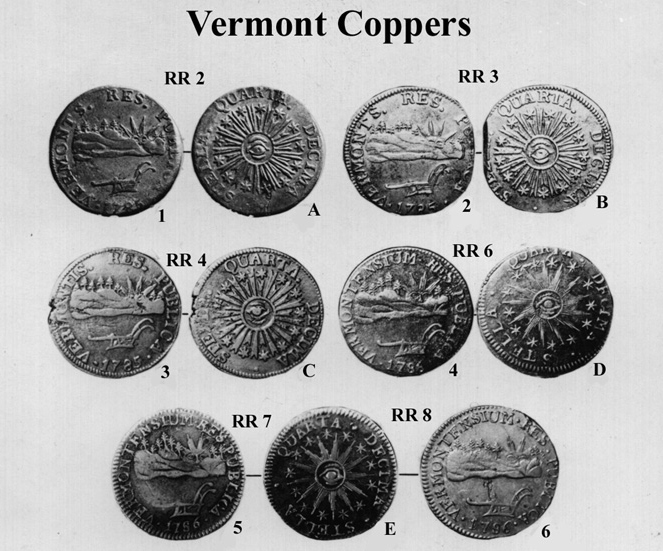 Vlack imitation halfpence numbers and Miller Connecticut copper numbers are included where appropriate. 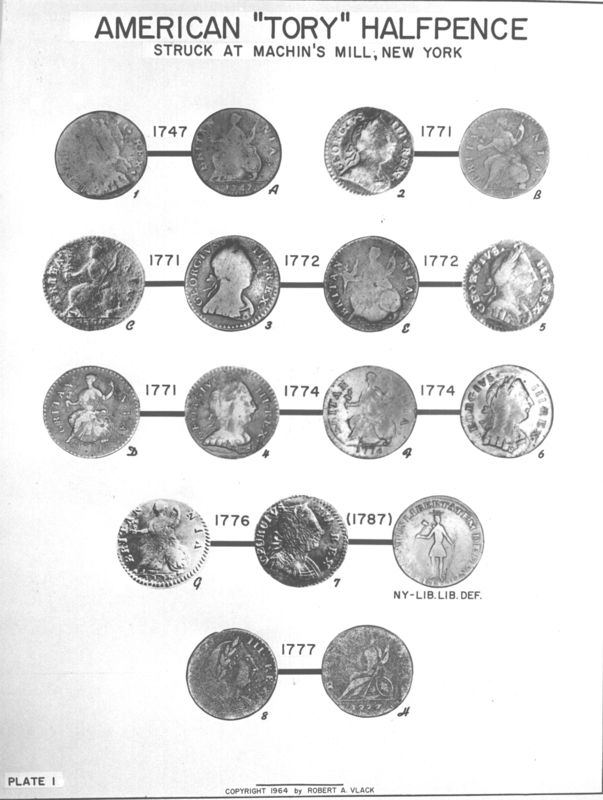 The charts are presented as clickable 125 dpi jpg images. 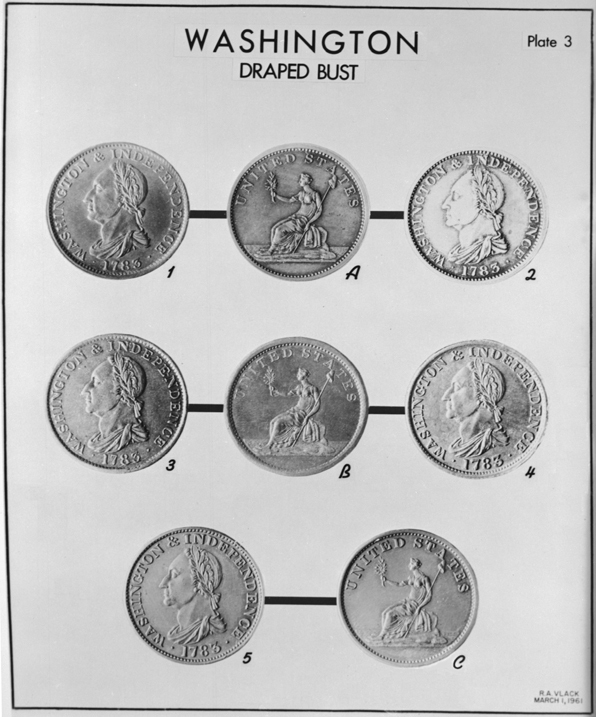 For fast downloading the upper and lower portions of each chart are also offered seperately. 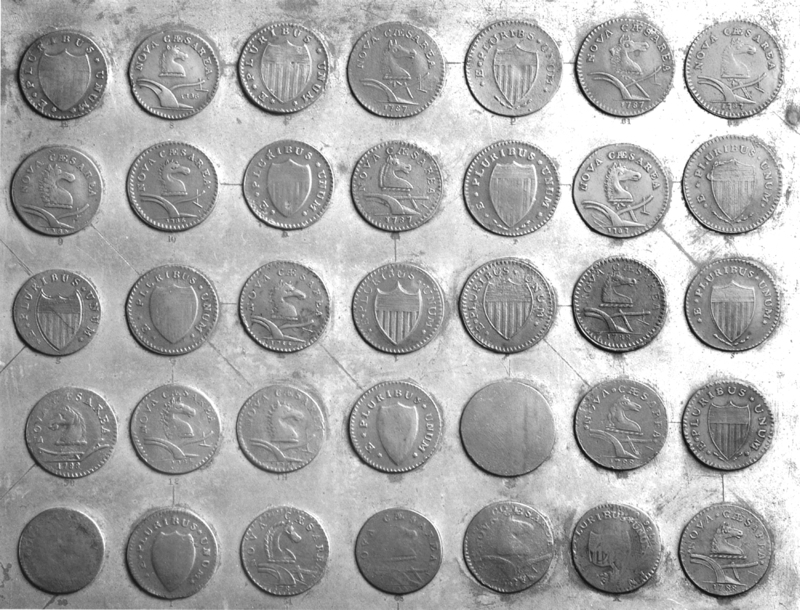 Table 1 - Bressett 1-9 This is the Full image. 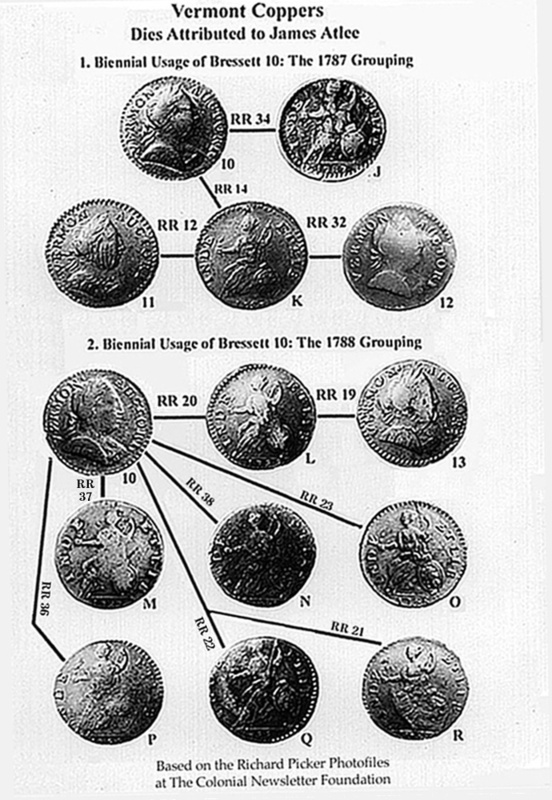 Table 2 - Biennial groupings of Bressett 10 This is the Full image. 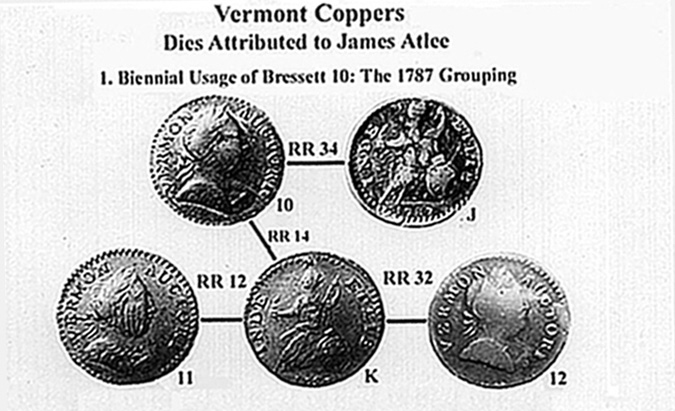 These dies, attributed to James Atlee, include Bressett 11-13. 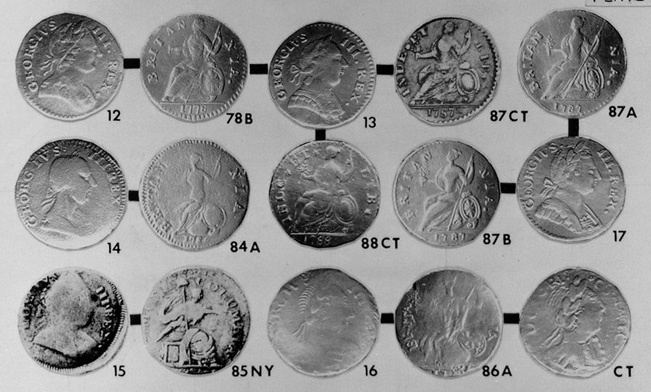 Table 3 - Bressett 14-16 and 21-25 This is the Full image. 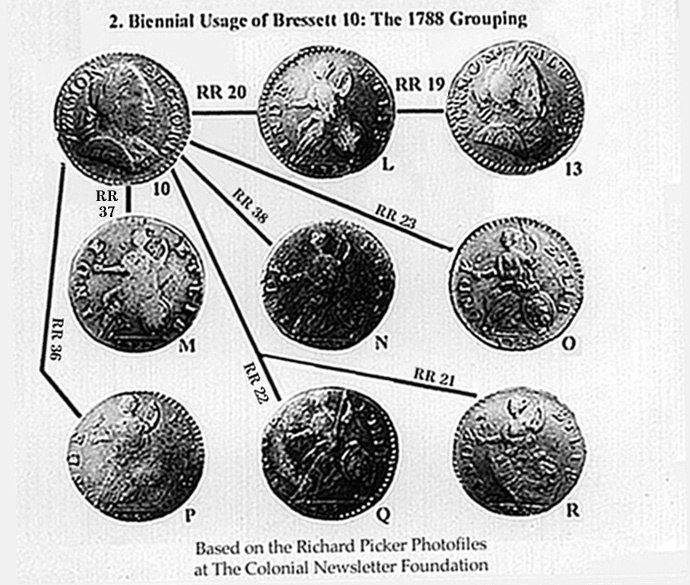 Table 4 - Bressett 17-20, 26 and RR-5 This is the Full image. 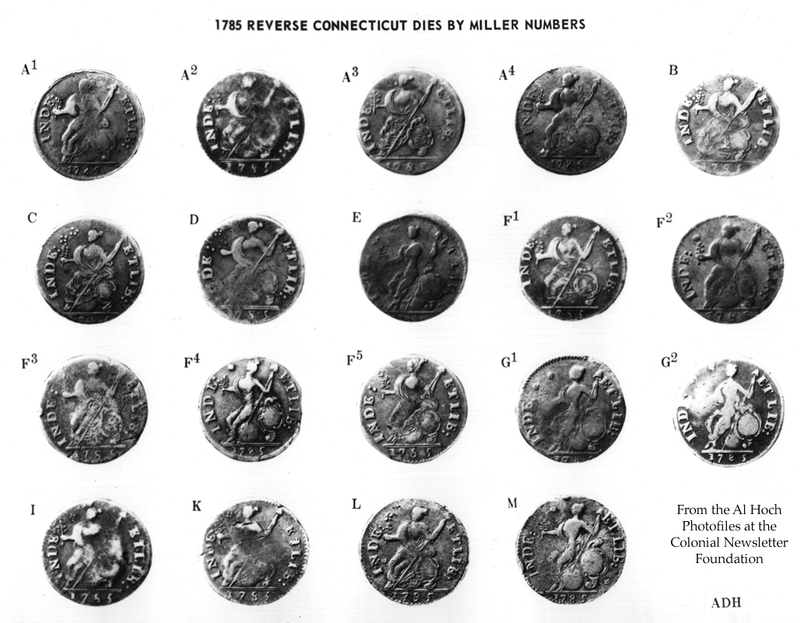 Through the Al Hoch Photofiles at The Colonial Newsletter Foundation, Jim Spilman has provided scans of charts for Connecticut obverses and reverses for 1785 and 1788. 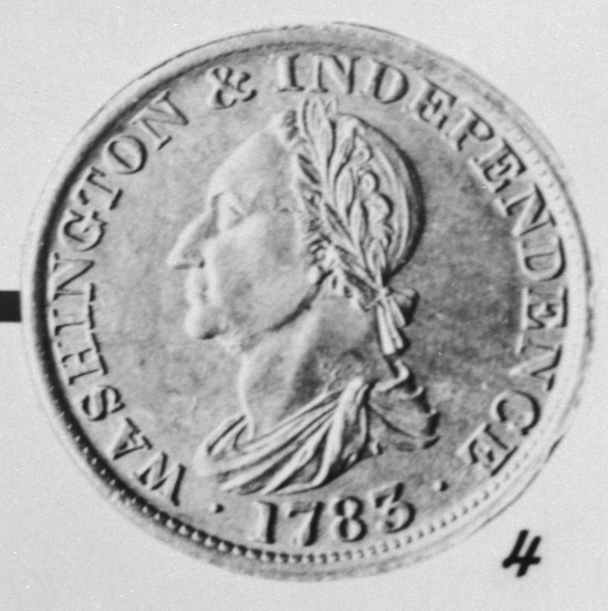 The charts use the Miller numbers designated in the older superscript style, thus for 1785 Miller 12.1 the designation is 121. 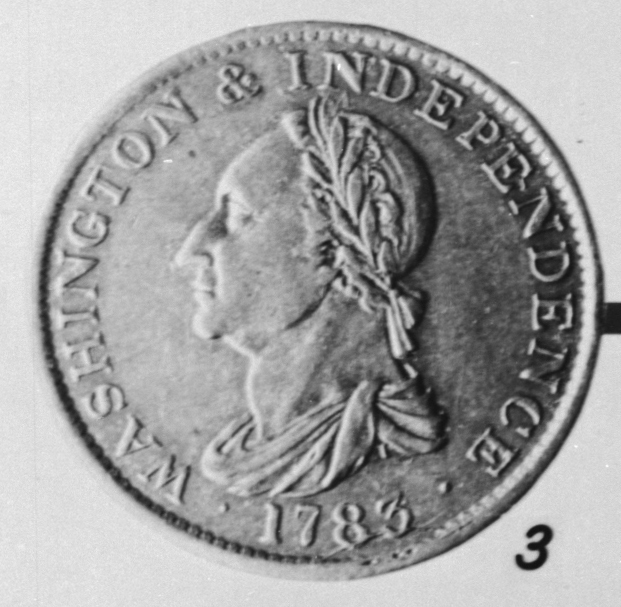 The charts are presented as clickable 125 dpi jpg images. Because of their size (about 500K as compressed JPEG images) half size charts are also available. 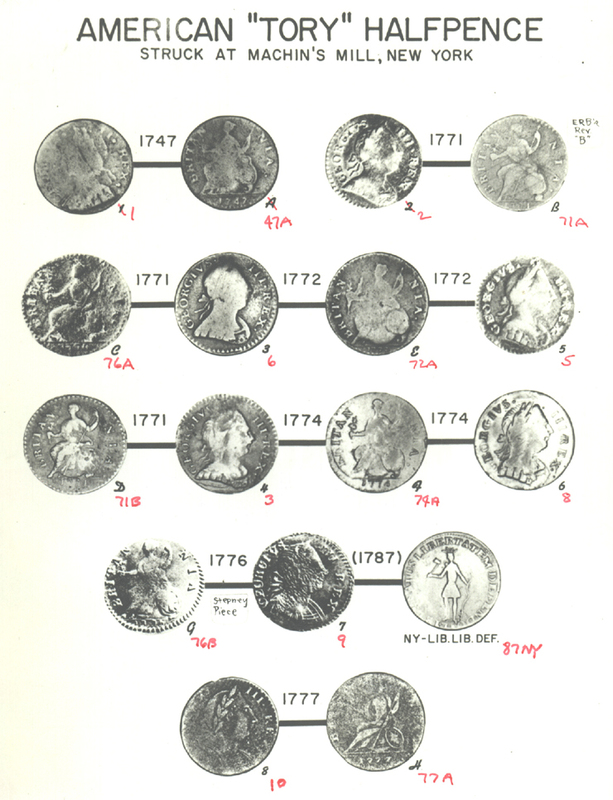 Full chart of CT 1785 Obverses 1 - 8. 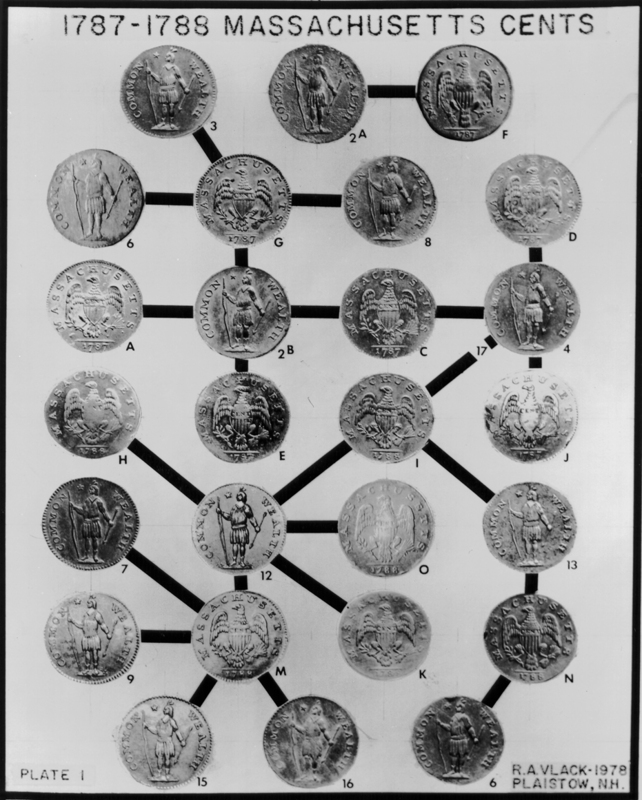 Full chart of CT 1785 Reverses A.1 - M.
Full chart of CT 1788 Obverses 1 - 17. 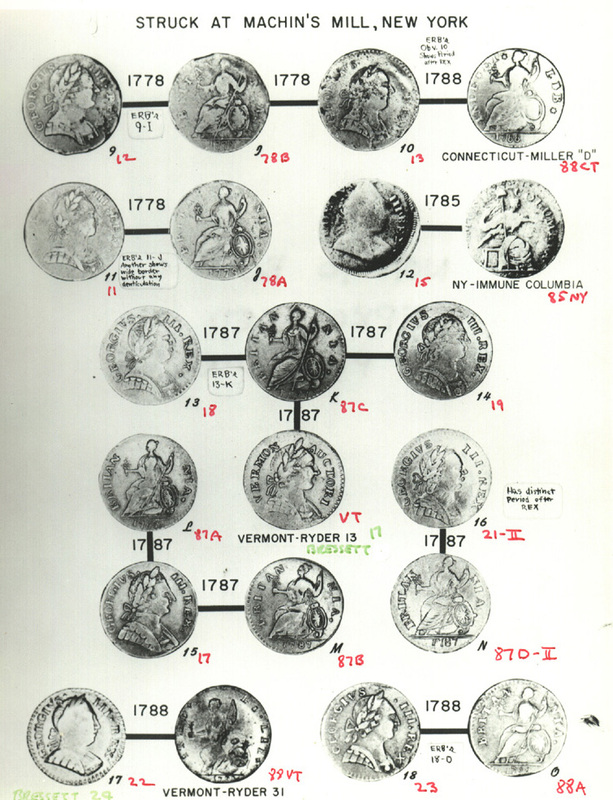 Full chart of CT 1788 Reverses A.1 - S.
1975 EAC Ct coppers identified in order by date and Miller obverse. 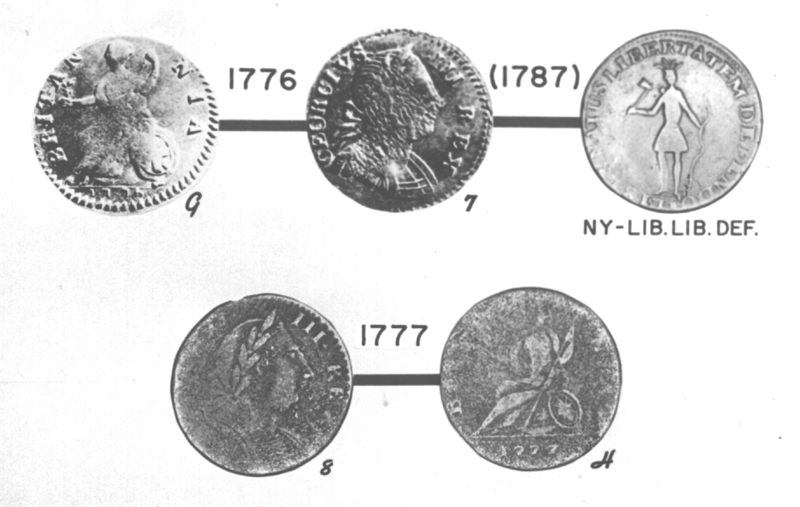 A number of charts exist showing the numerous NJ obverse and reverse die varieties and their known pairings. 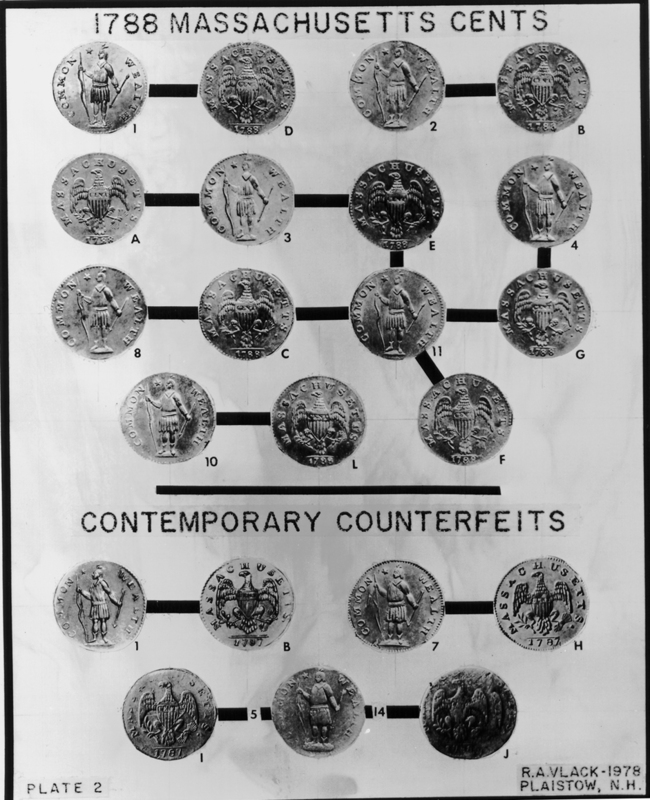 However, the chart which has withstood the test of time and still serves as the primary reference for identifying NJ coppers is a photograph which appeared in 1881 as part of the classic book, A Historical Sketch of the Coins of New Jersey, written by Edward Maris, MD. 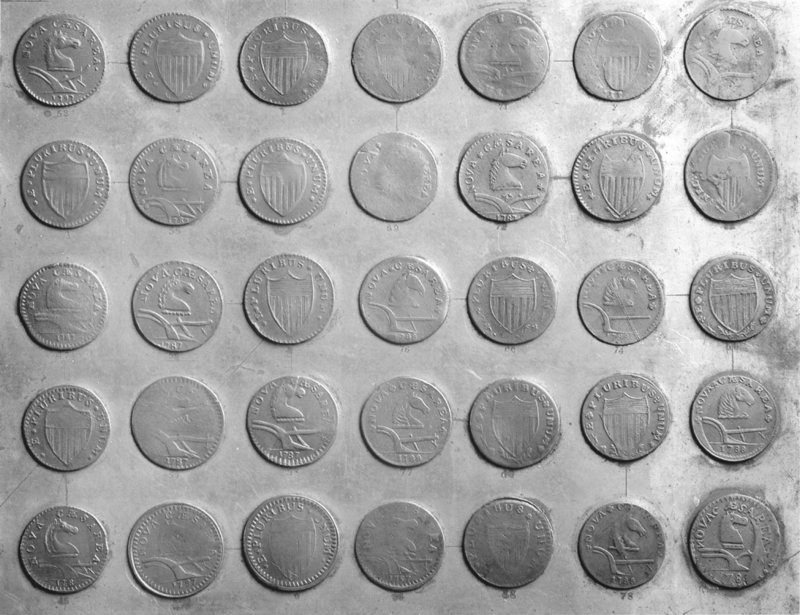 A copy of this photograph, which measures 14 3/4 inches by 19 1/8 inches, broken down into four quadrants can be viewed by clicking below. 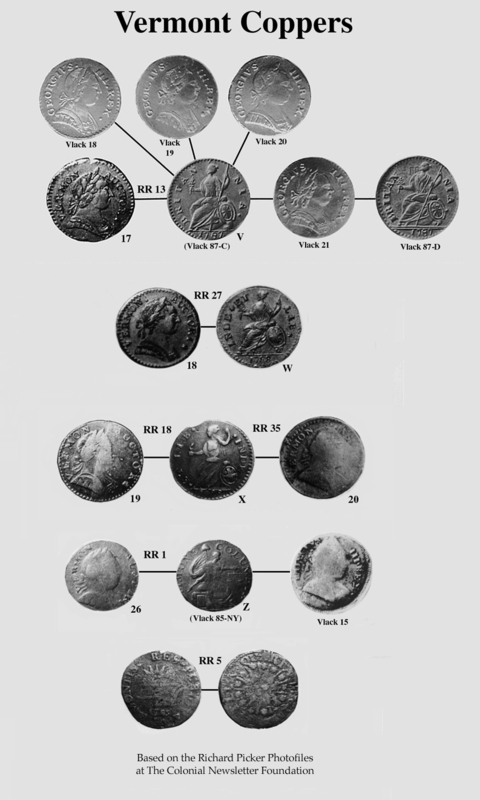 Maris Plate-1 Photograph: Upper left quadrant. 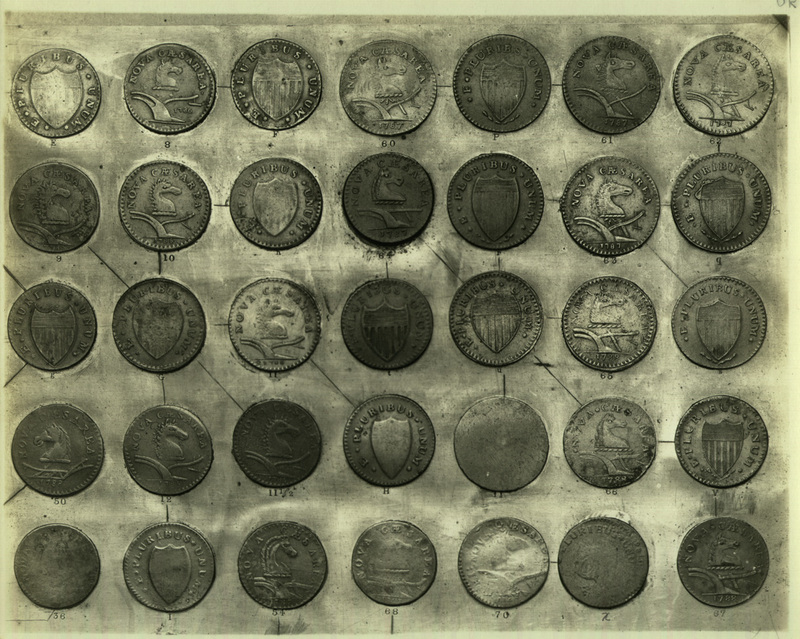 The Maris 1881 photograph is called the Maris Plate-I Photograph and is a picture of an actual plate made up of the know die varieties of the NJ coins using real coins, electrotypes of coins and possibly photographs of coins. 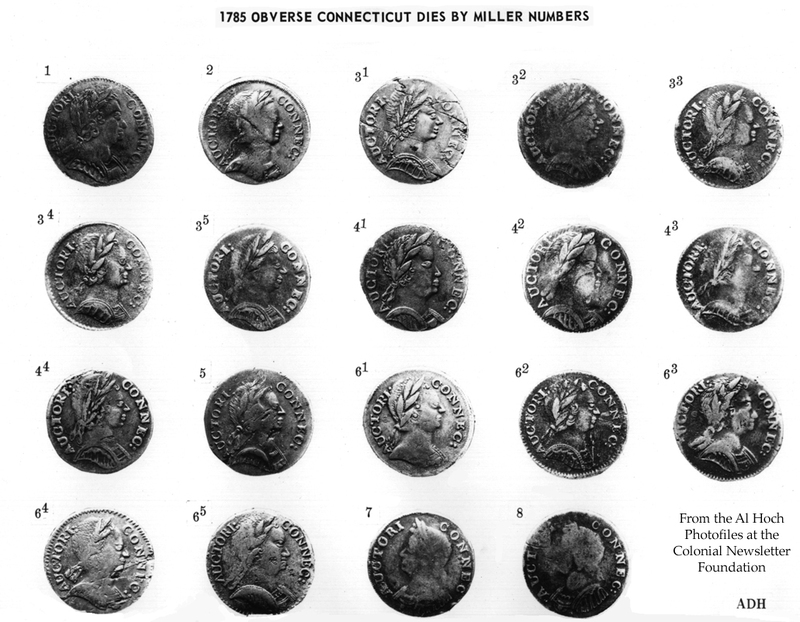 Each die variety is indicated by a specific number (for the obverse dies) or letter (for the reverse dies). 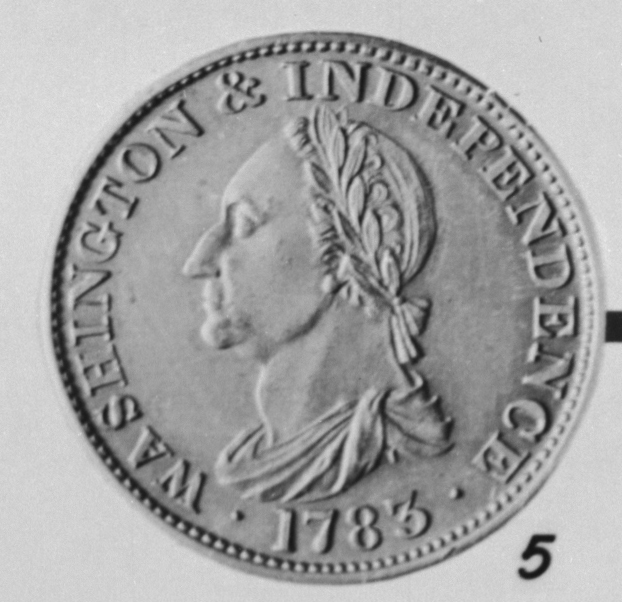 The die combinations are shown by ligature lines draw between the relevant obverse and reverse dies. 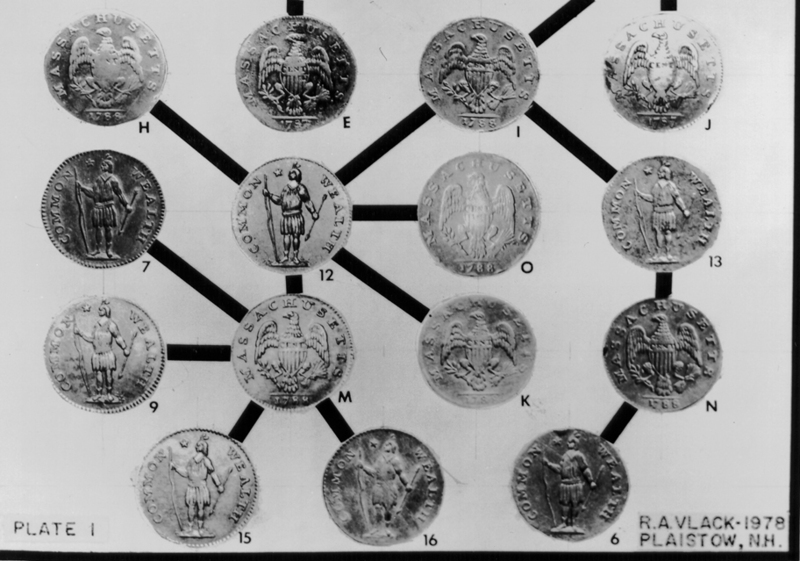 Once the Maris Plate-I was photographed, it was disassembled and no know portion of this plate is know to exist at this time. 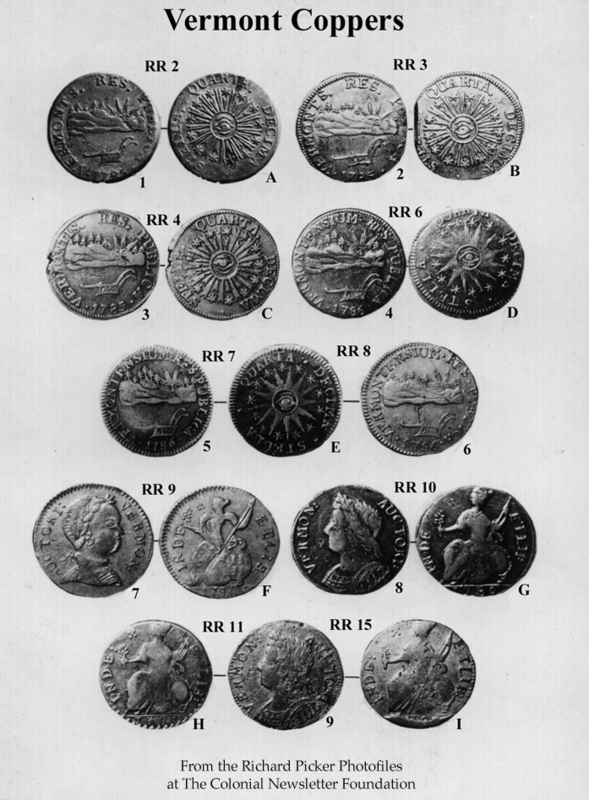 The following four images are used with permission from the Maris Plate-II in the Collection of the New Jersey Historial Society (Accession number 1953.44). 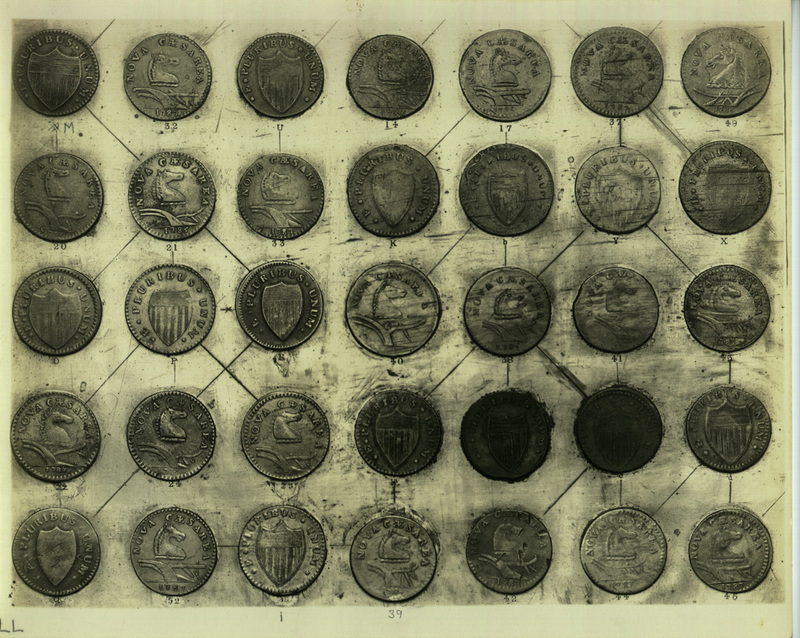 A third plate made up of a zinc sheet with 140 electrotypes of NJ die varieties soldered to it which was made by Dr. Maris presently exists in a private collection. 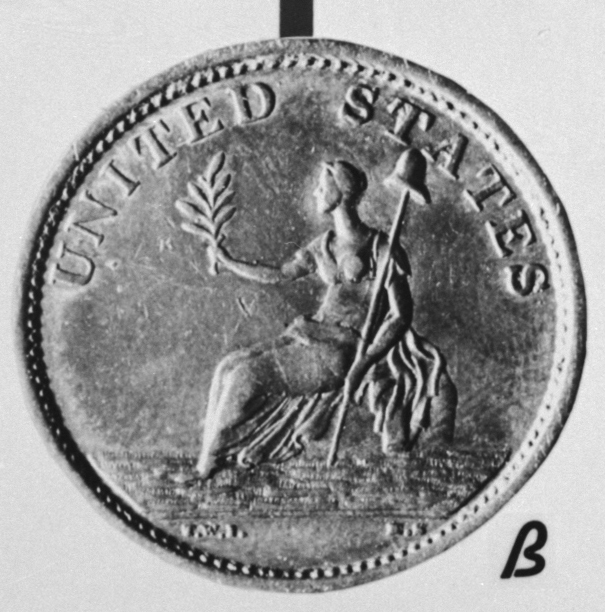 It was made at some point after the Maris Plate-II. 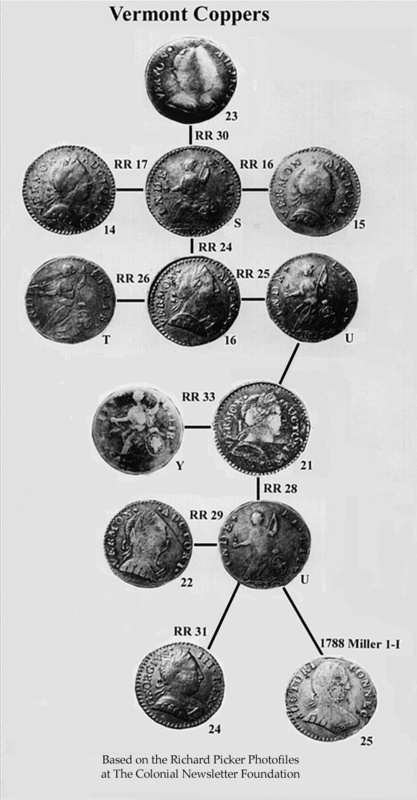 The primary difference in the Maris Plate-III, compared to the Maris Plate-II, is the rearrangement of the electrotypes in the lower left quadrant in order to allow for a better representation of the "21-R" die combination. 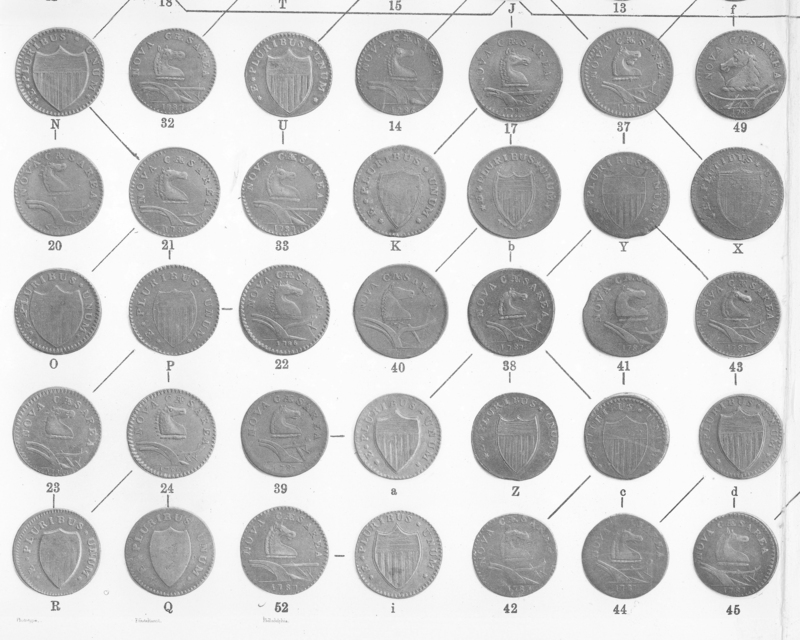 In the 1940s a photographer names Steven Nagy made four photographs of the Maris plate-III representing each quadrant. 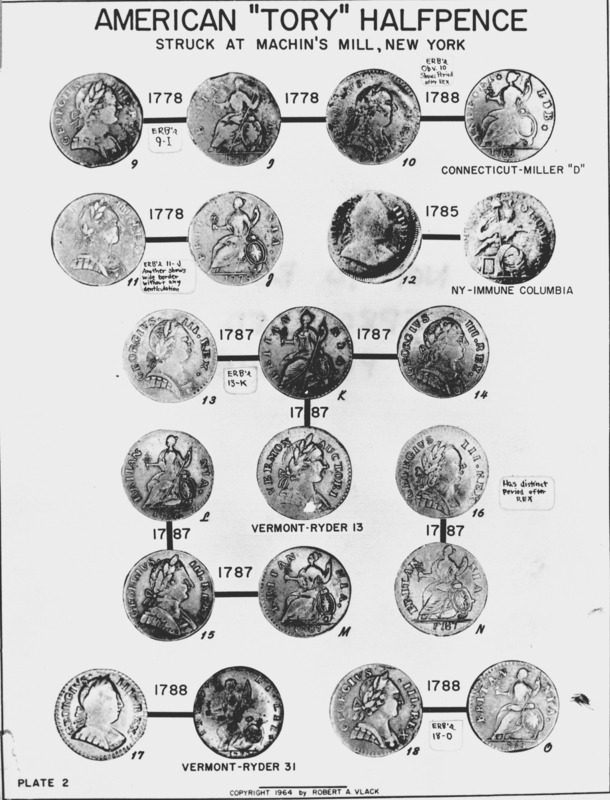 Sets of these photographs are occasional available for purchase and one set (in the CNLF photofiles), which has been written on in a number of places to make corrections, can be viewed by clicking below. 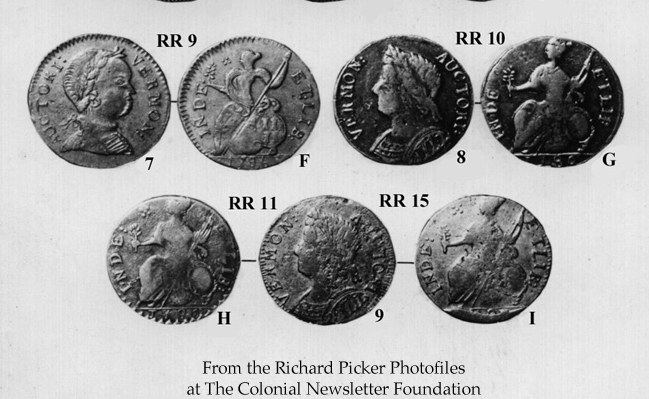 A more complete description of the three Maris plates is available in an article, "The Maris Plates", by Roger Moore MD and Dennis Wierzba, published in The Colonial Newsletter, vol. 43, number 2, August 2003, sequential page 2495-2527. 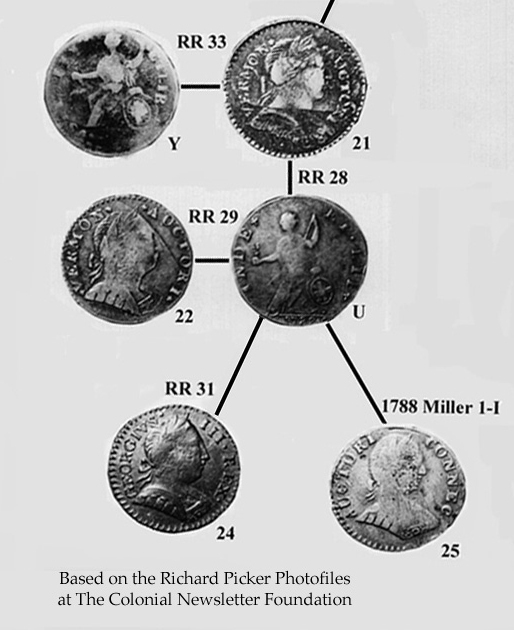 When combined with reverse B to strike P.11 a hairline die crack forms in an arc behind the effigy�s head. 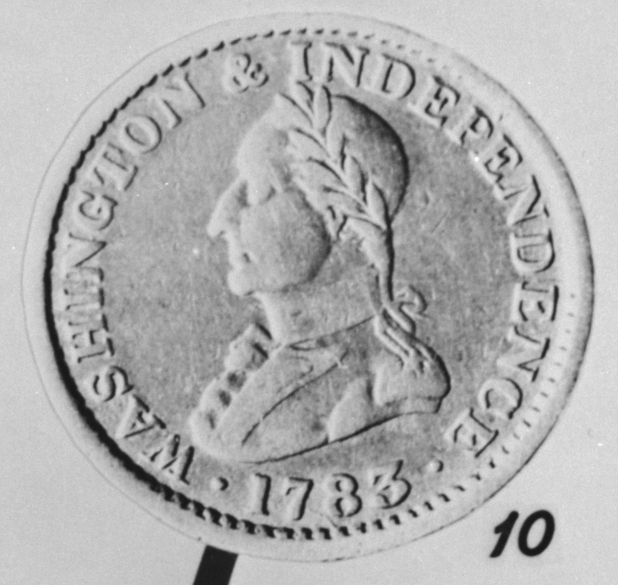 Thus, P.10 was struck first. 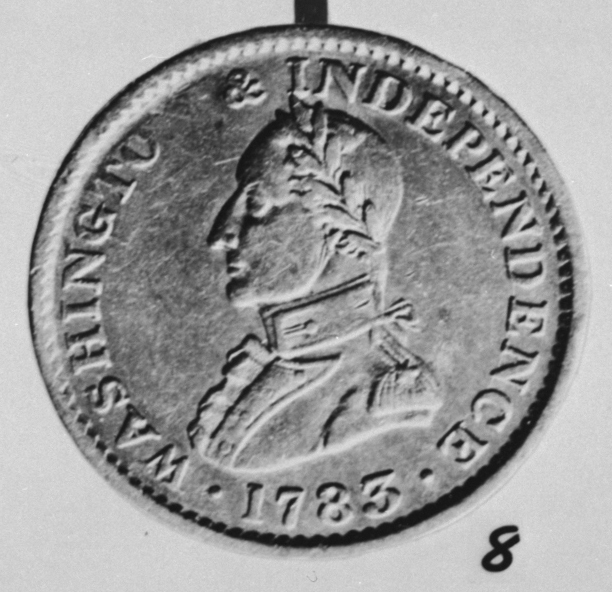 Unknown to Pridmore. 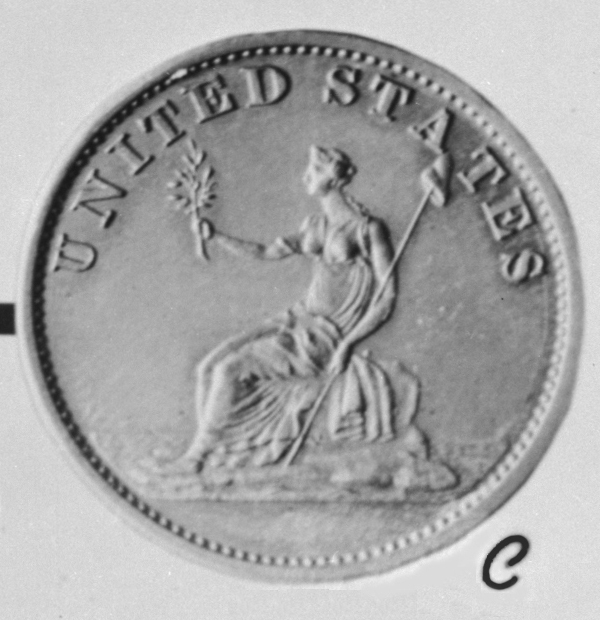 Similar to obverse 1 but the legend SERVE is widely spaced, especially between the E and R. Also, the stem of the center feather curves to the right while with all other obverse dies it curves to the left. 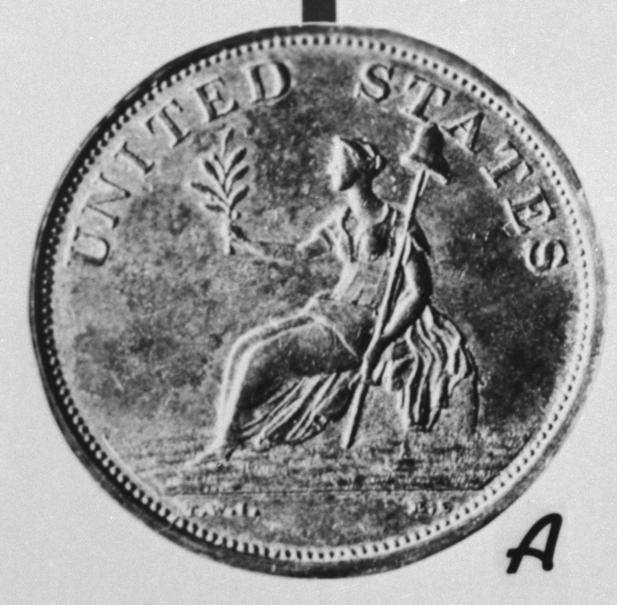 Large die break in the field to the right of the effigy when combined with reverse D (P.13). 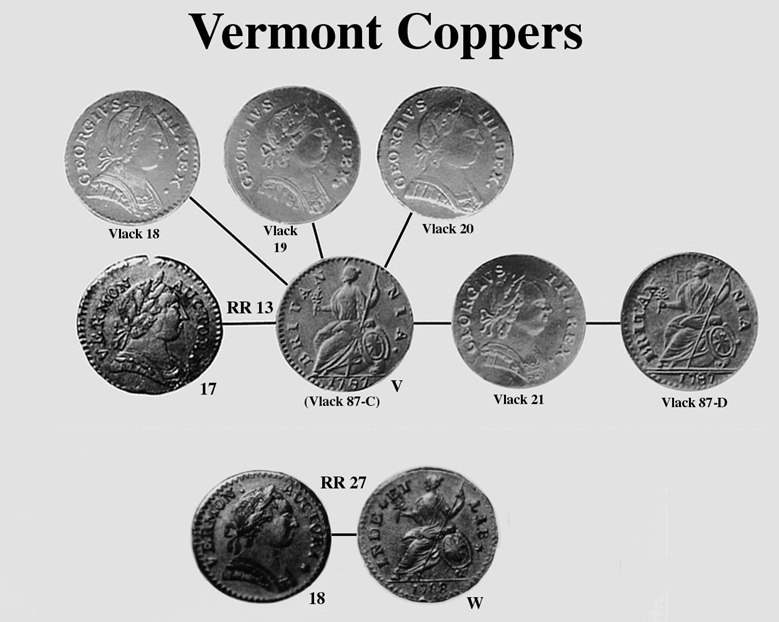 When married to reverse C (P.12) there is no break. 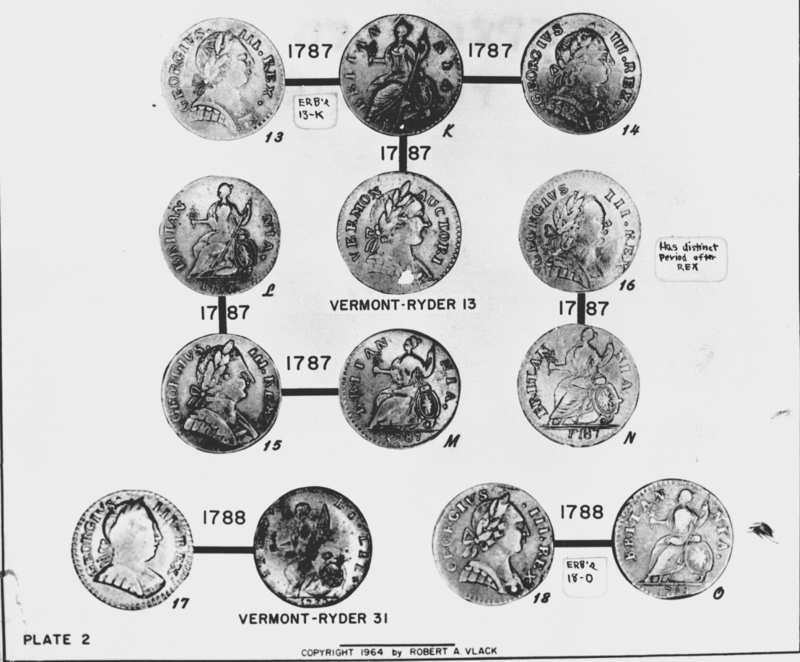 Thus, P.12 was struck first. The R in the legend SERVE tilts to the left. 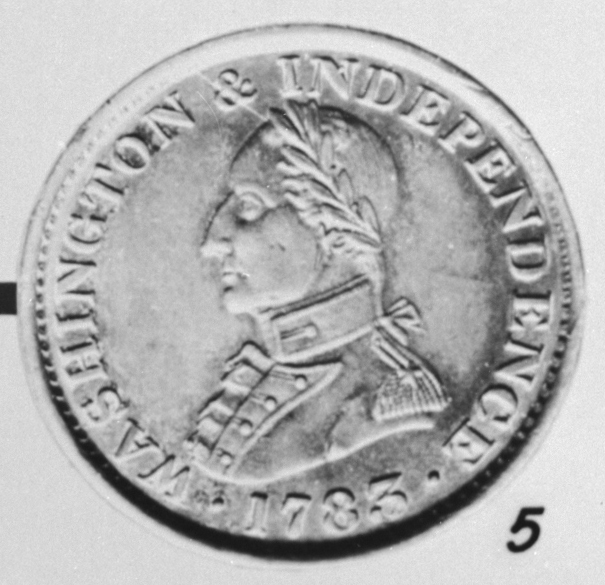 Unknown to Pridmore. The R in the legend SERVE is nearly vertical. 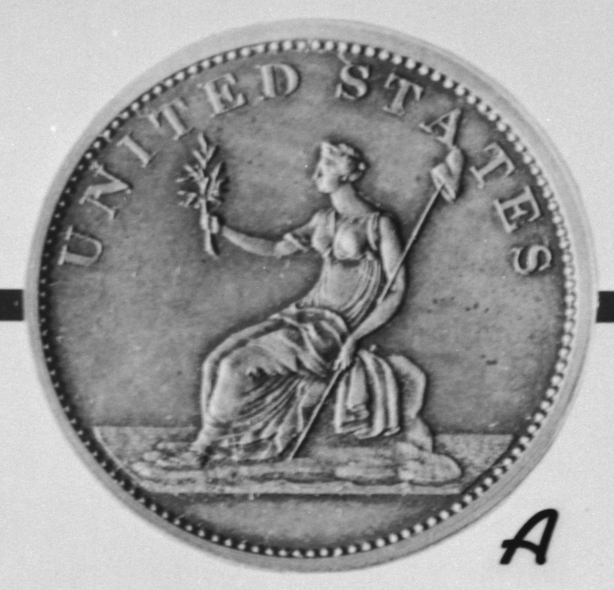 Faint die chip in front of the effigy�s brow can be seen on some specimens. 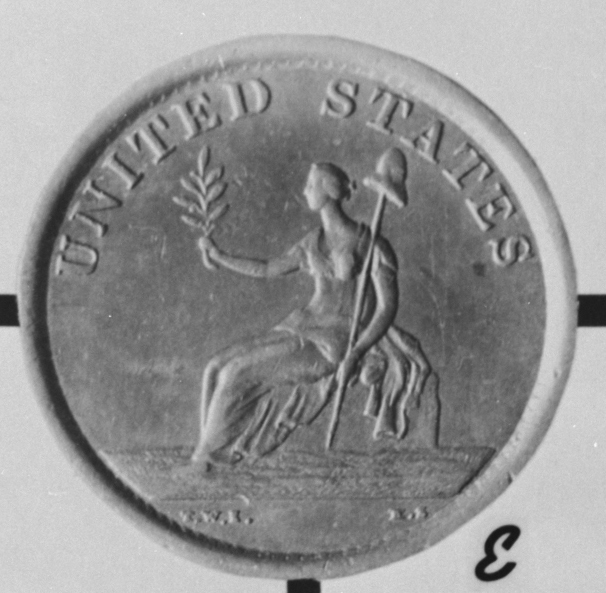 Heavily lapped obverse 5. 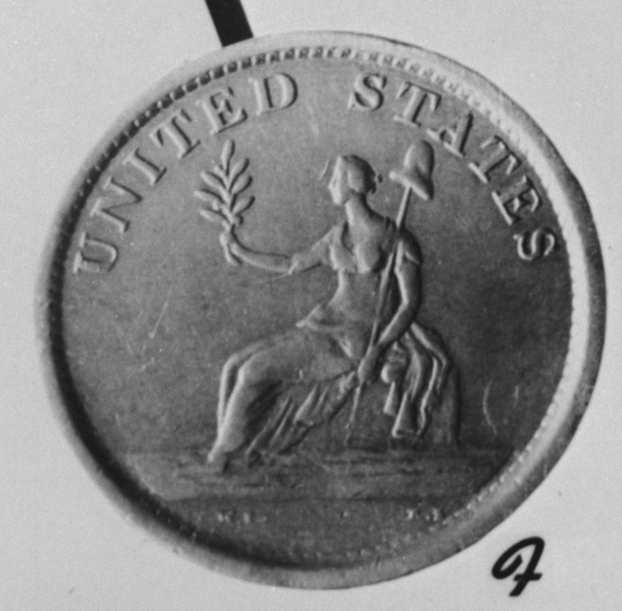 The die chip in front of the effigy�s brow is much more pronounced. Tall pineapple base. 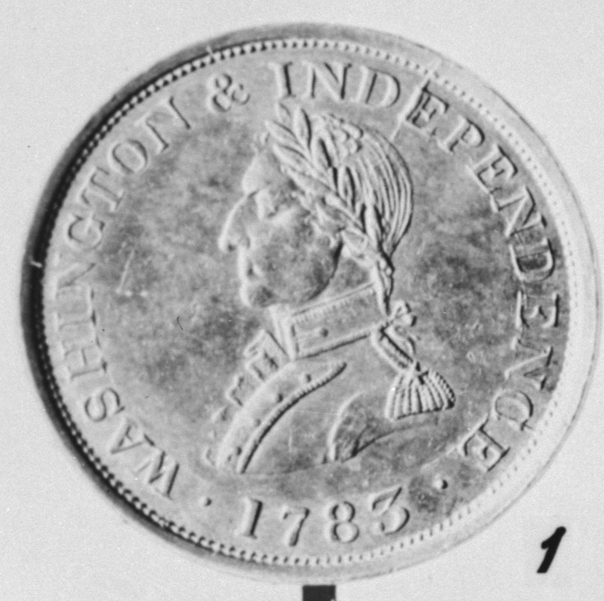 High 1 in date. 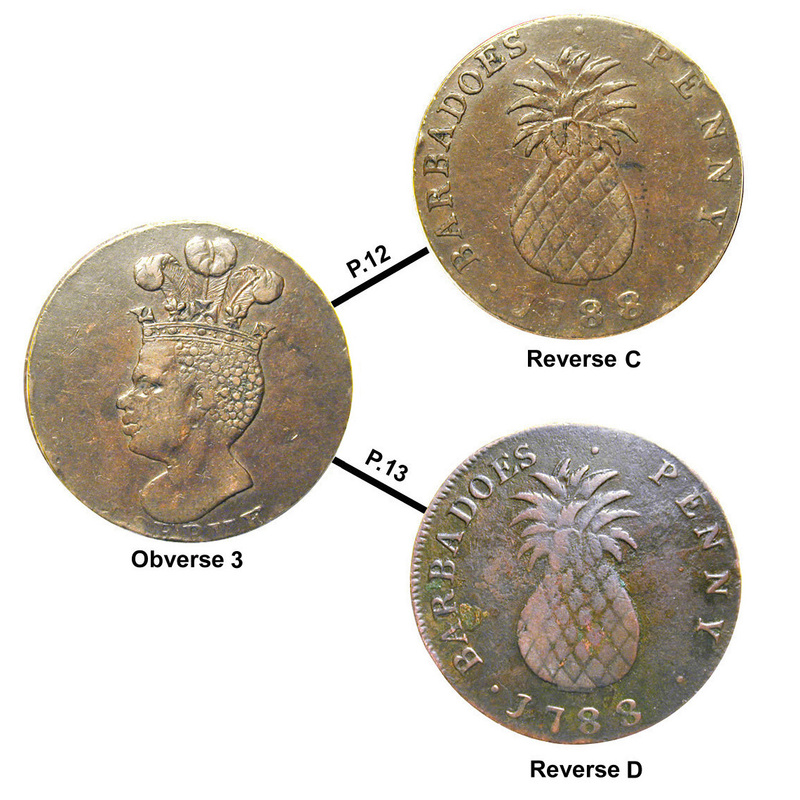 When combined with obverse 1 (P.11), a die chip appears just to the right of the stop above the pineapple leaves. 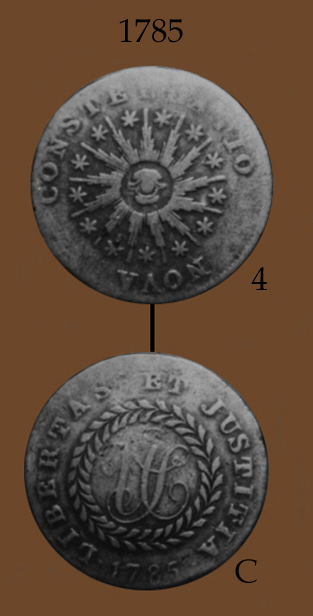 A prominent die scratch touches the O in the legend BARBADOES. 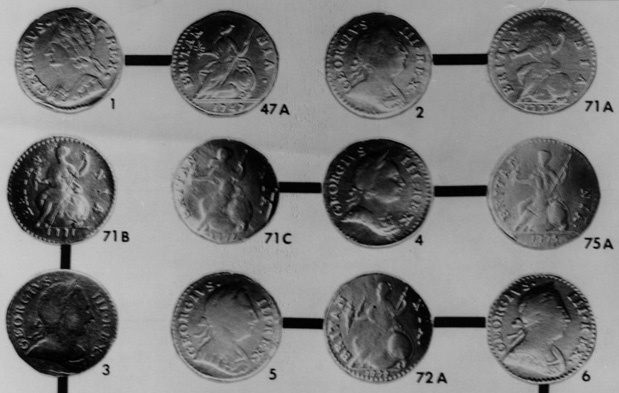 These defects are not present when married to obverse 2. 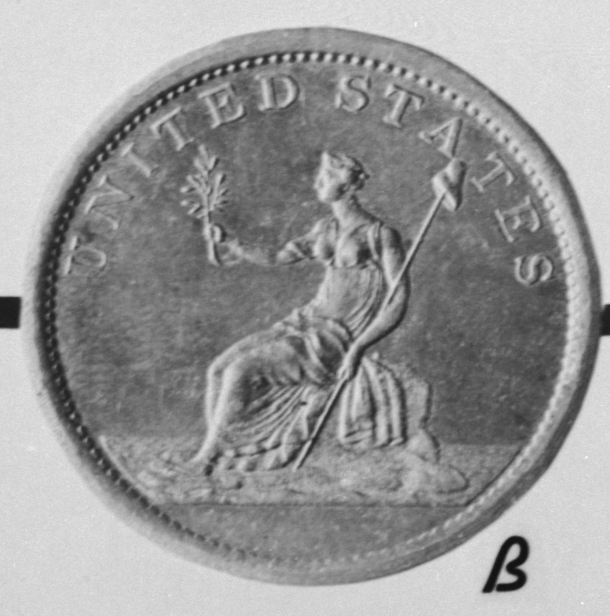 Thus, combination 2-B was struck before 1-B (P.11). Fatter pineapple than the previous two dies. 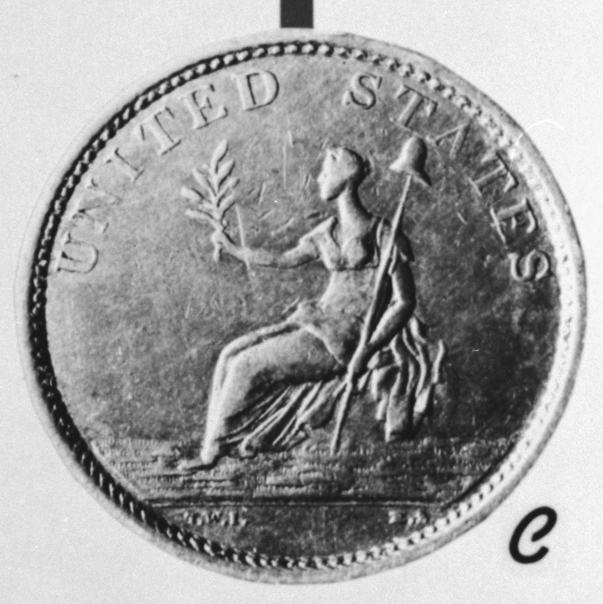 Ghost image behind the top three leaves. 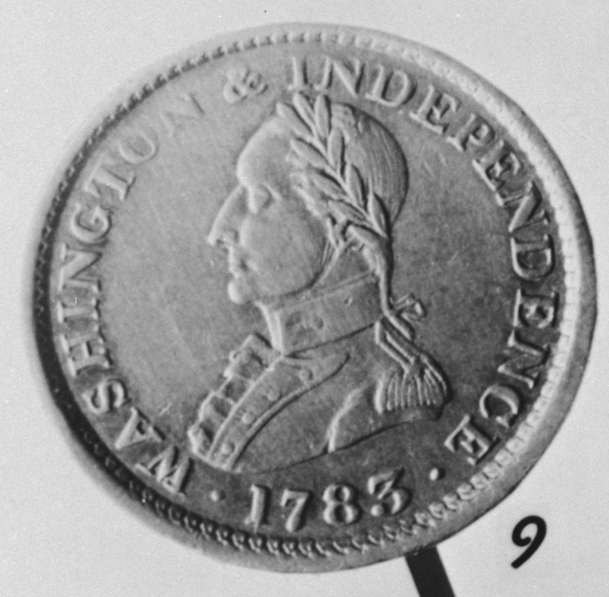 Wide space between the 1 and 7 and between the two 8s of the date. Ghost image behind the top three pineapple leaves. 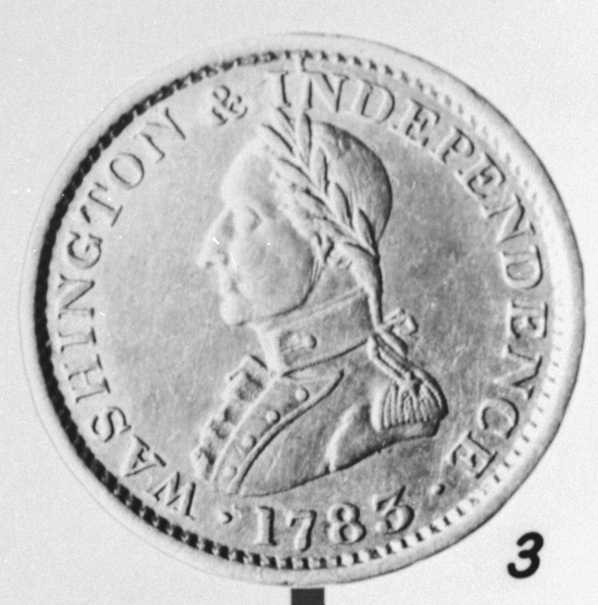 Unknown to Pridmore. 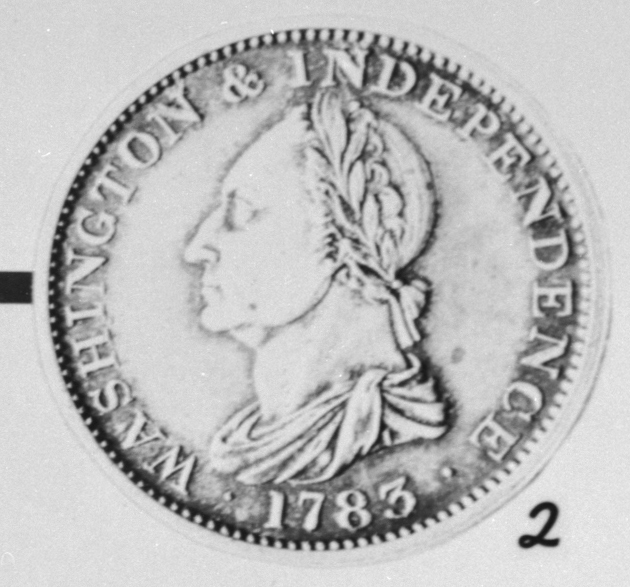 Wide space between the 17 and 88 of the date. 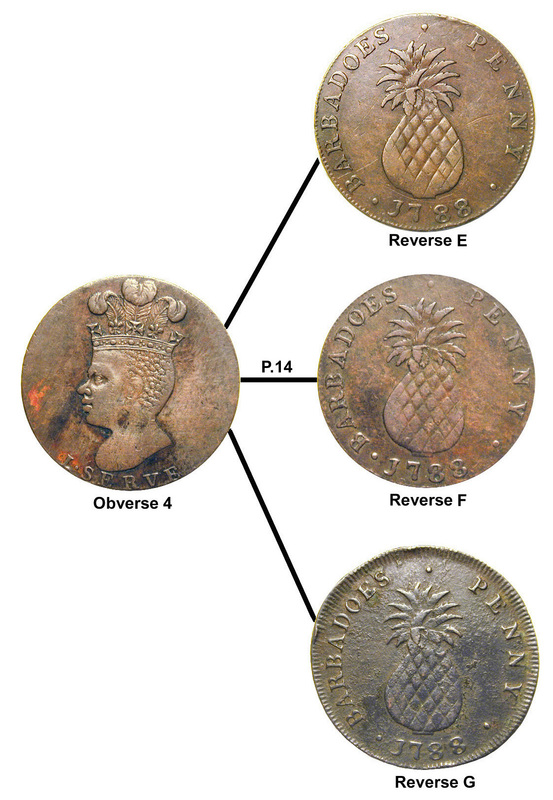 Right upper most pineapple leaf points directly at P in the legend PENNY. 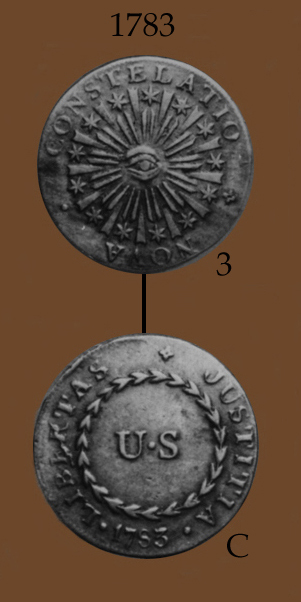 The die crumbles around the second A in the legend BARBADOES in later die states. 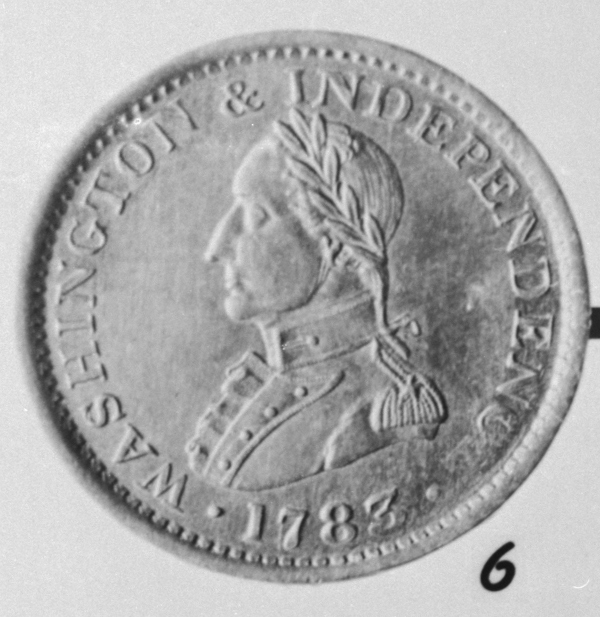 Unknown to Pridmore. 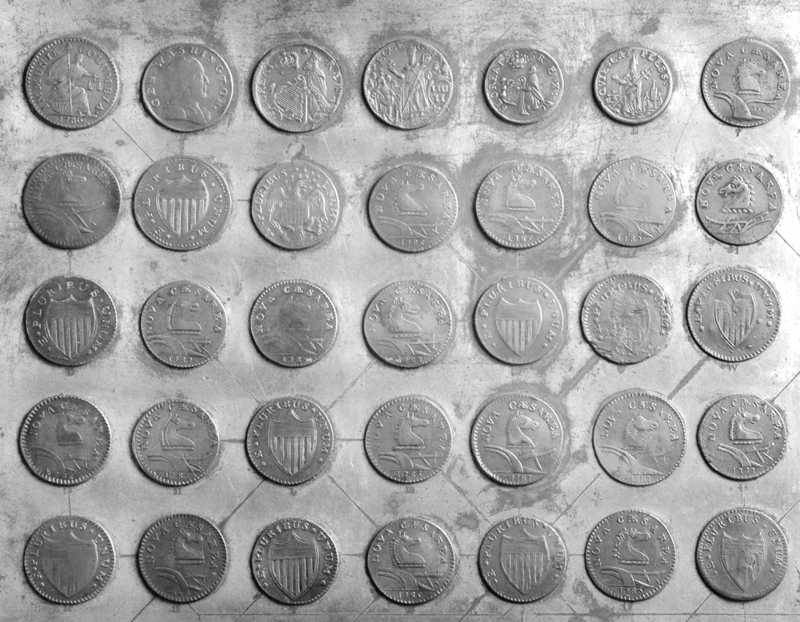 Last 8 in the date wider spaced than the other numerals. 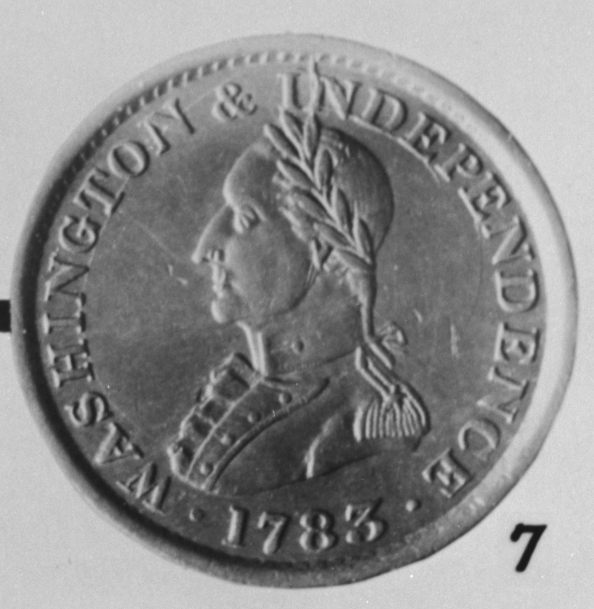 Unknown to Pridmore. Wide pineapple base. 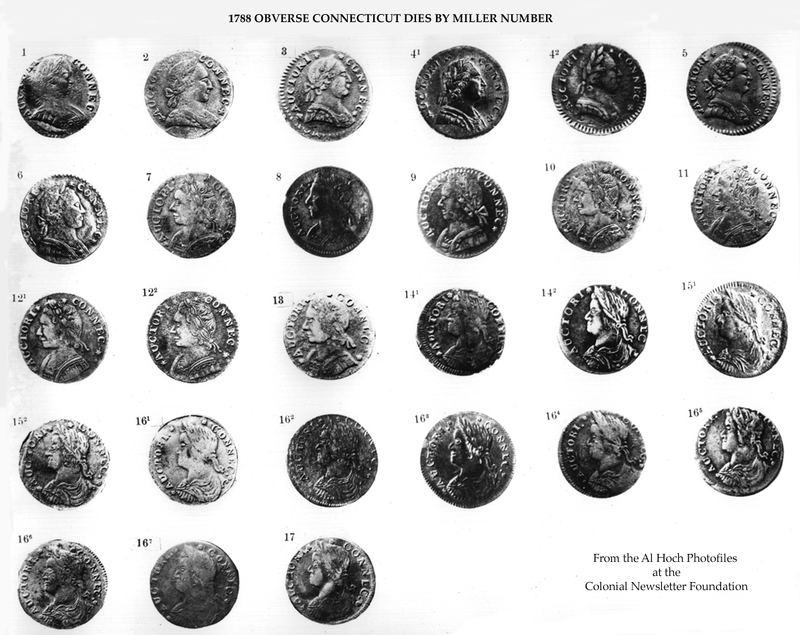 Digits of date widely spaced. Ghost image behind the top three pineapple leaves. 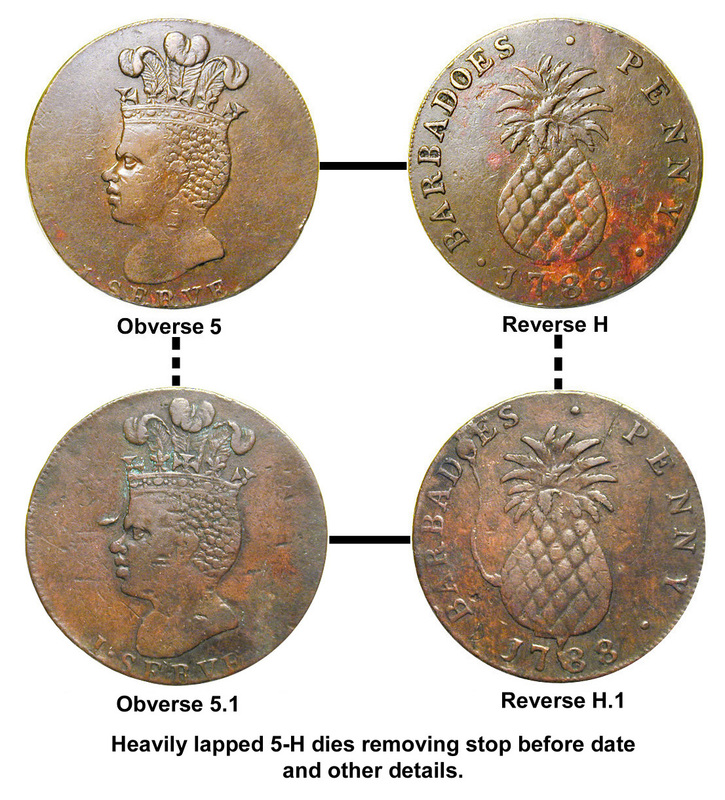 Heavily lapped reverse H. The stop between the legend BARBADOES and the date was removed by the lapping. 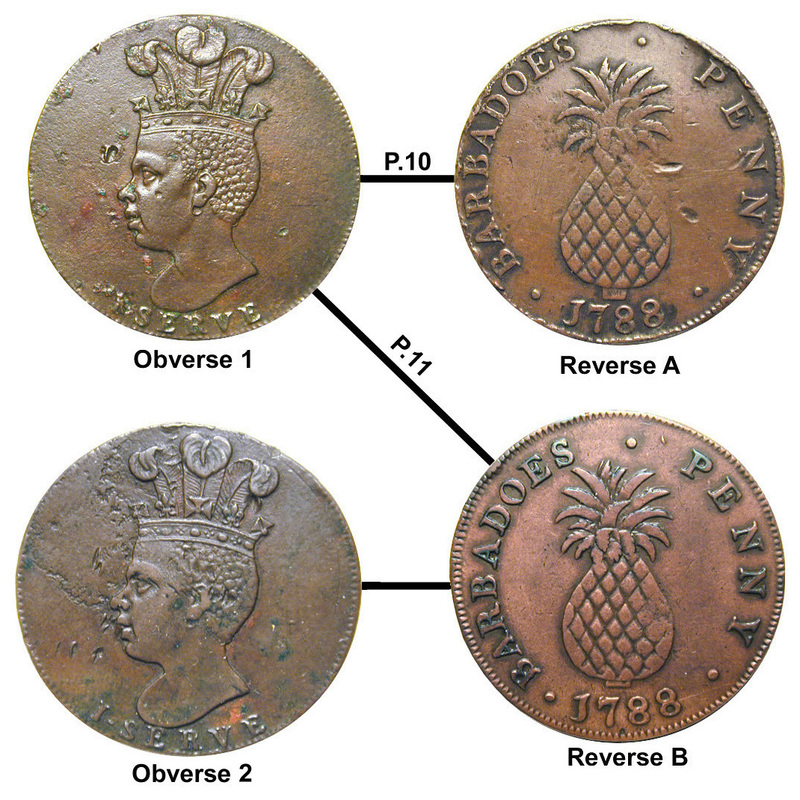 Heavy die break extending from the left side of the pineapple up through the O in BARBADOES. 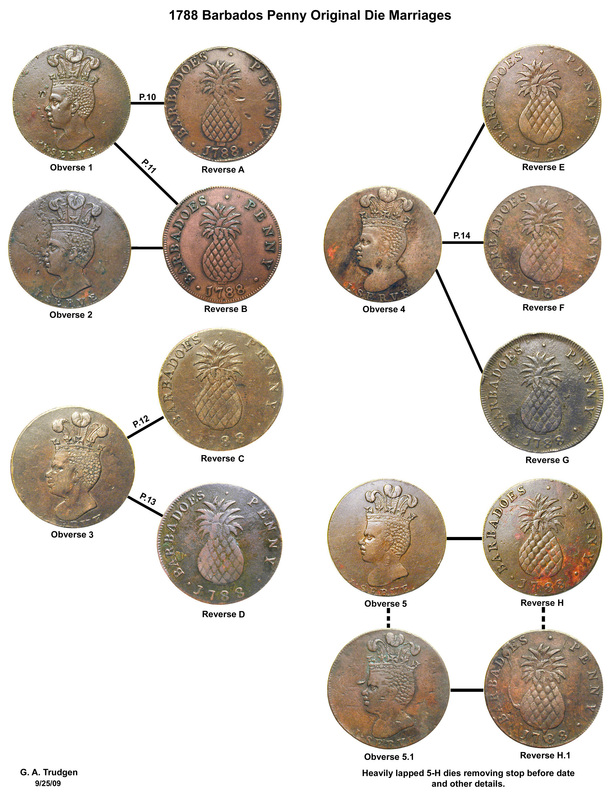 This break also appears at the pineapple base and projects along the left side of the first 8 in the date. 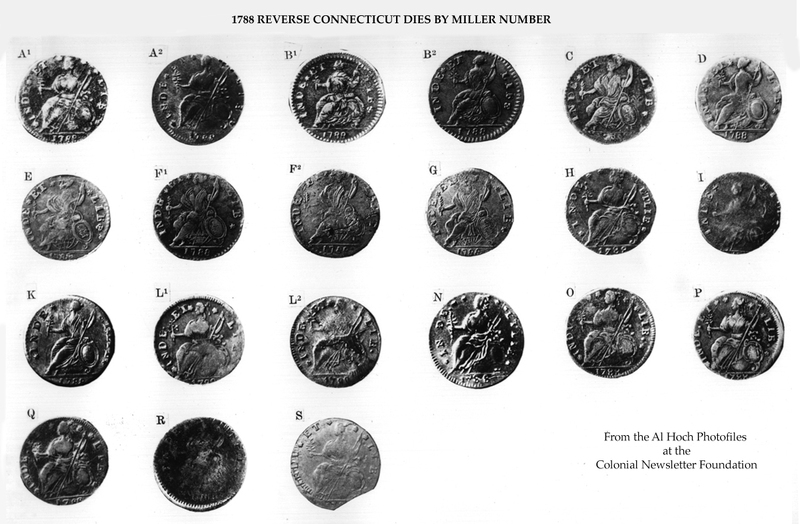 From the C4 Photofiles Angel Pietri has provided color obverse and reverse images of selected New Jersey varieties in Maris number order, starting with Maris 10-G. Attributions have been updated and corrected by Ray Williams in an e-mail of Sept. 10, 2003. 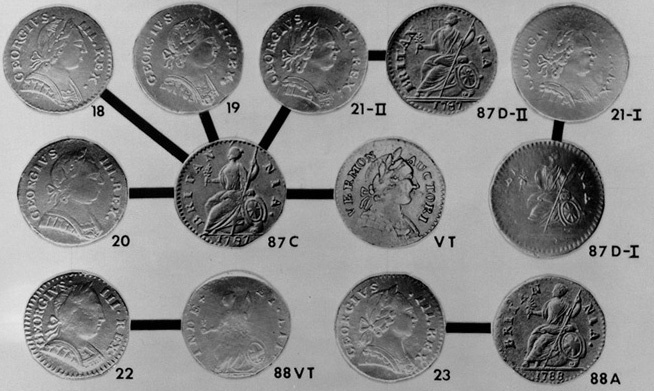 The number following the Maris attribution is the C4 photo number. 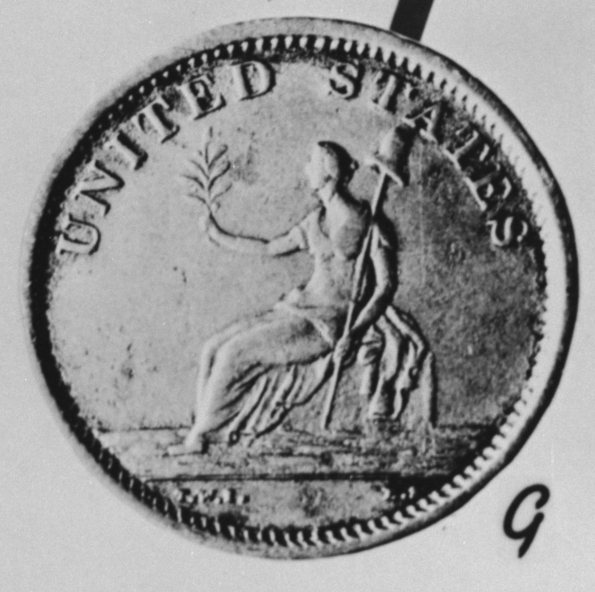 Thus Maris-10-G-1093 represents a New Jersey Maris 10-G combination, which is inventoried as image 1093 in the C4 Photofile. 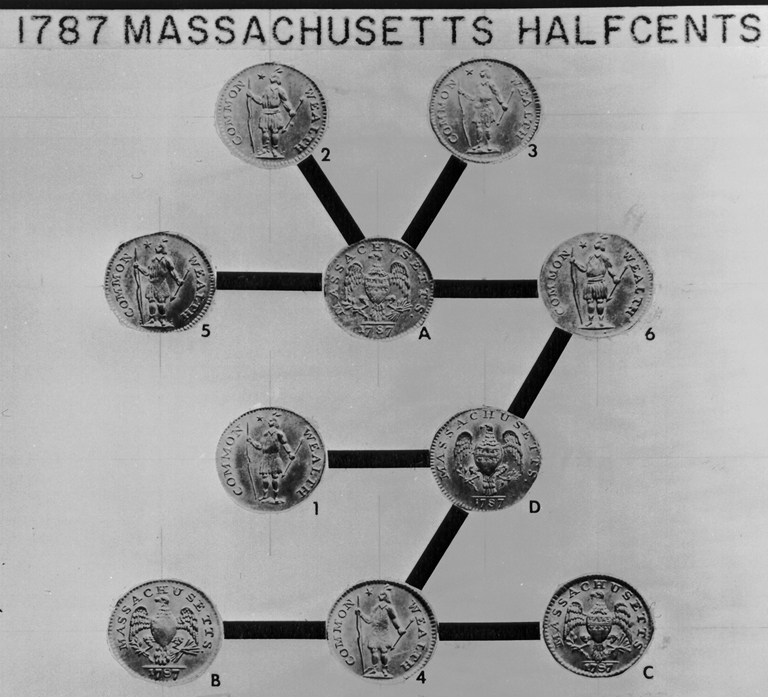 Below are copies of the Robert Vlack Massachusetts cent and halfcent die charts created in 1978, including interrelated die groupings. 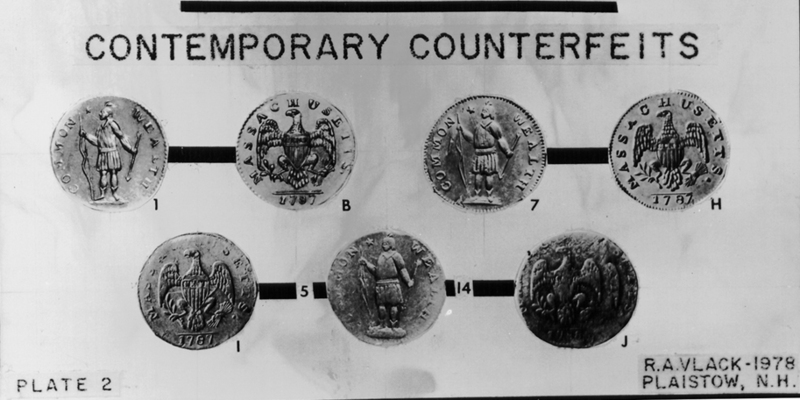 Contemporary conterfeits and a rarity scale are included. 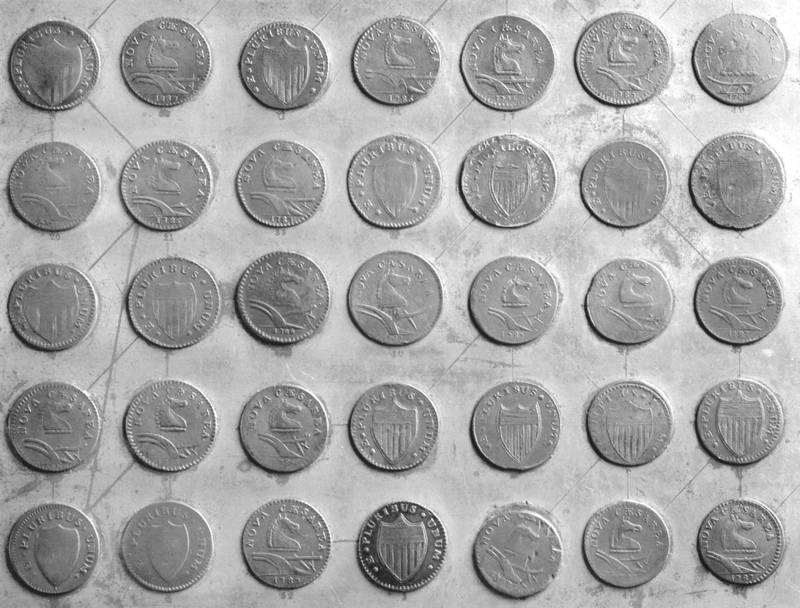 Ryder coin designations are listed. 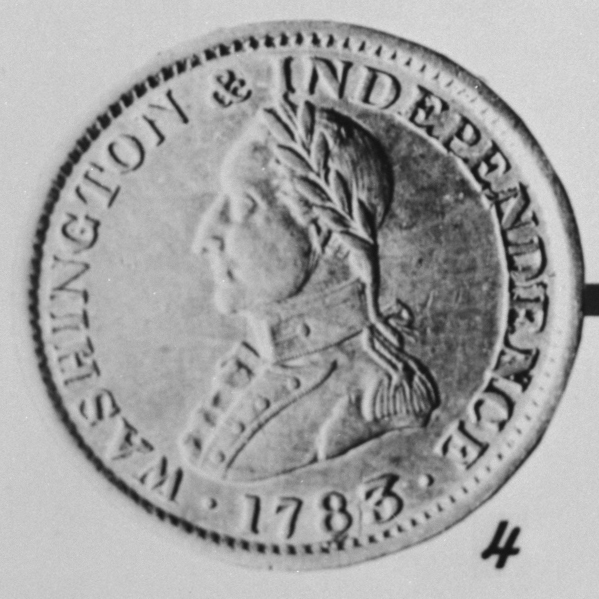 The charts are presented as clickable 125 dpi jpg images, with details available for specific types. 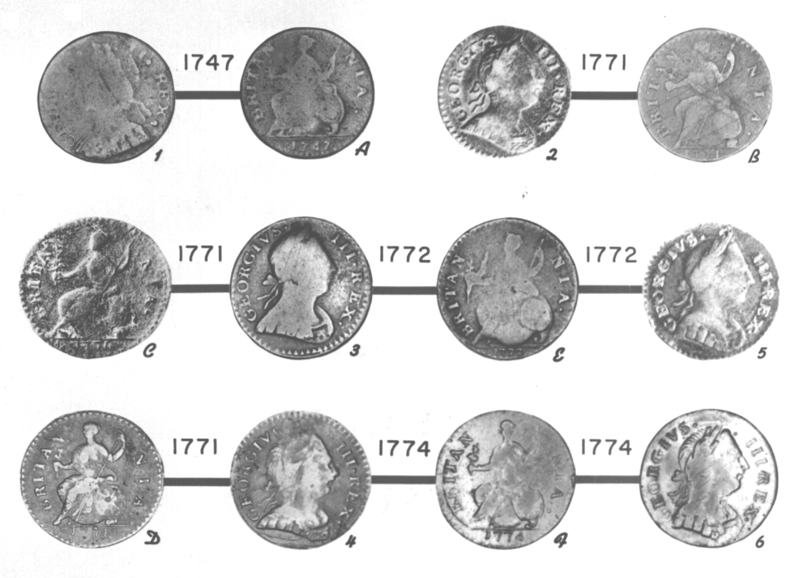 Chart I - MA 1787 cents and some of the 1788 cents. 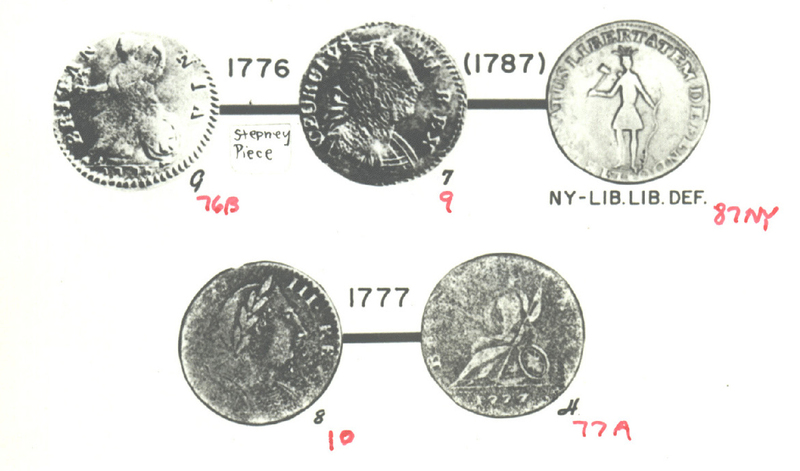 Chart 2 - a continuation of the MA 1788 cents along with contemporary counterfeits. 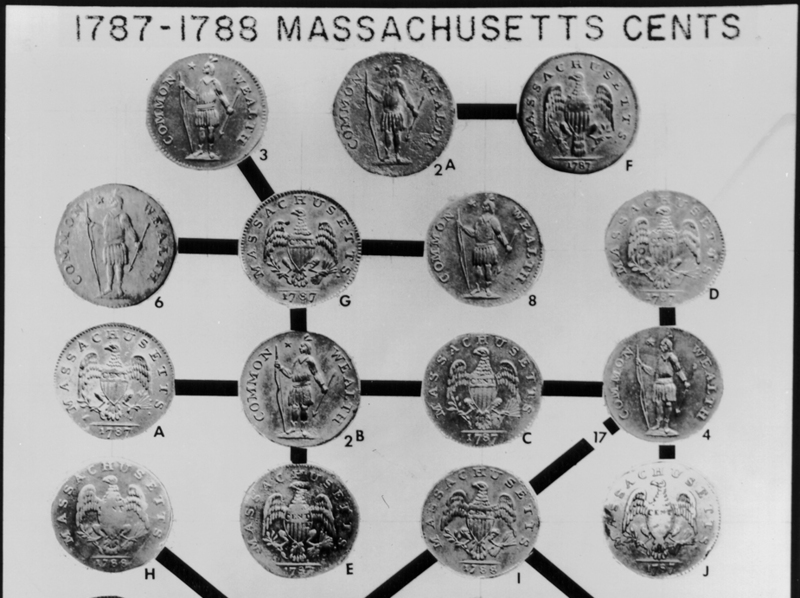 Full chart of MA 1787 and 1788 halfcents. 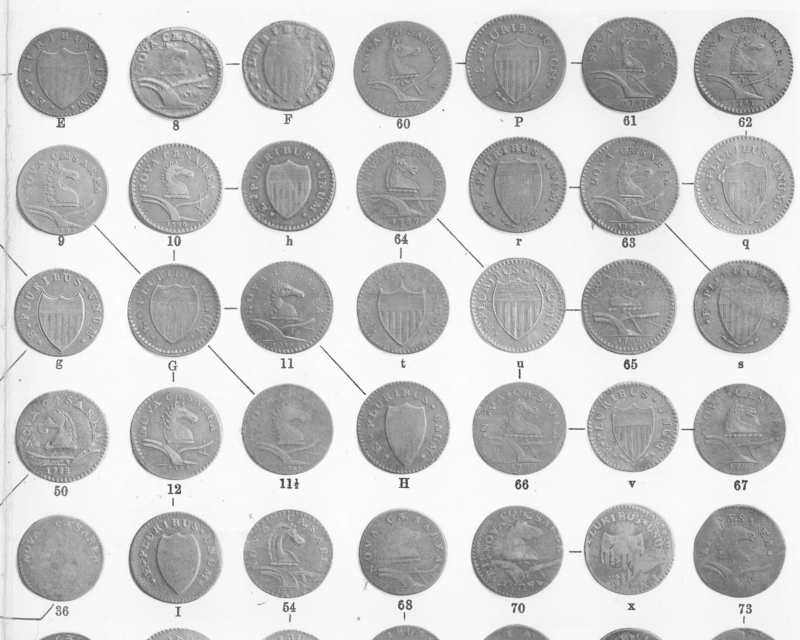 From the Photofiles at The Colonial Newsletter Foundation, Jim Spilman has provided black and white obverse and reverse images of many fugio varieties. 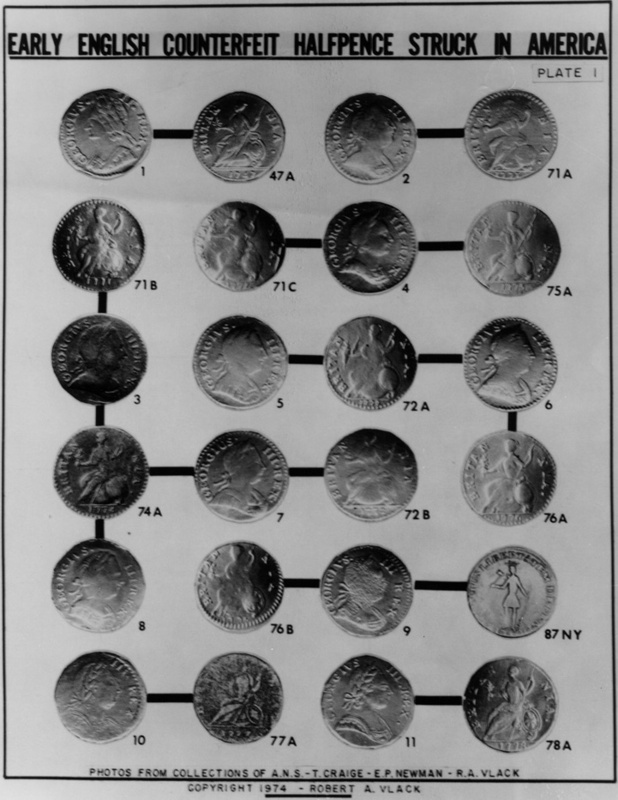 The varieties not represented are as follows: 1-Z; 1-CC; 1-Z; 9-S; 9-T; 10-OO; 11-X; 12-LL; 13-N; 13-R; 13-JJ; 13-KK; 14-H; 14-X; 16-H; 17-I; 17-T; 18-X; 19-M and 25-PP. 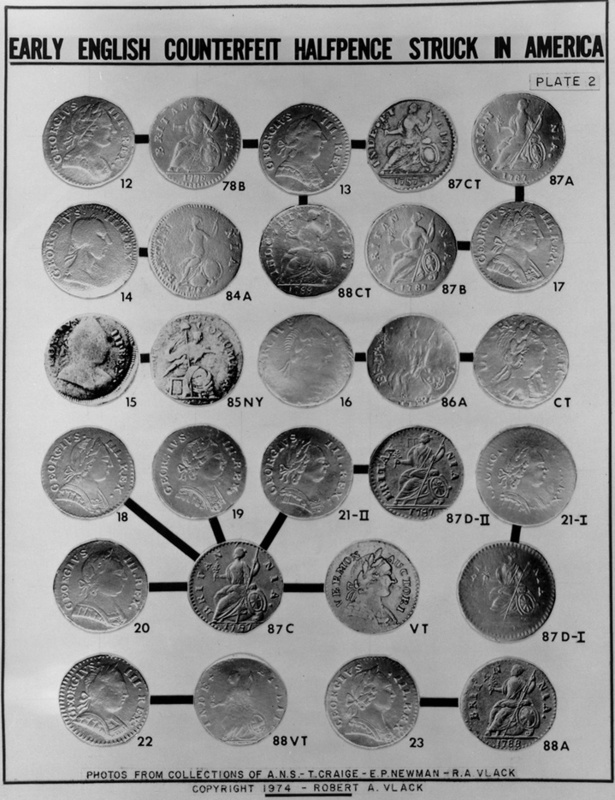 Also included are "restrike" varieties 104-FF and 105-QQ. 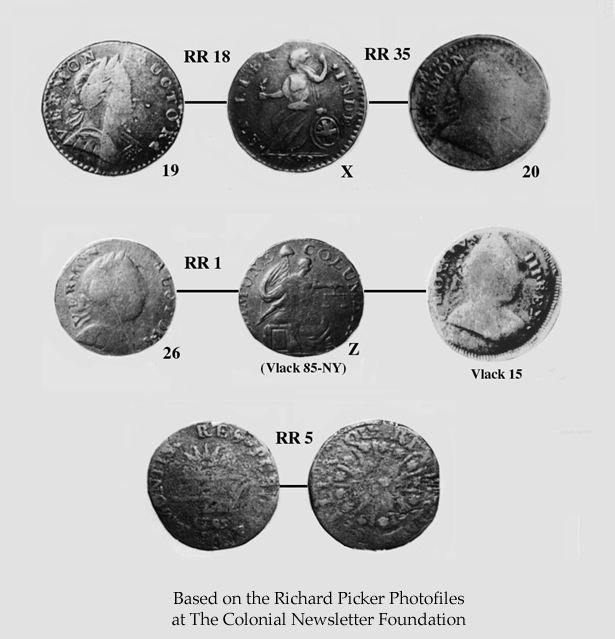 Earlier version of the Vlack plates from The Colonial Newsletter Foundation Photofiles provided and annotated by Jim Spilman. 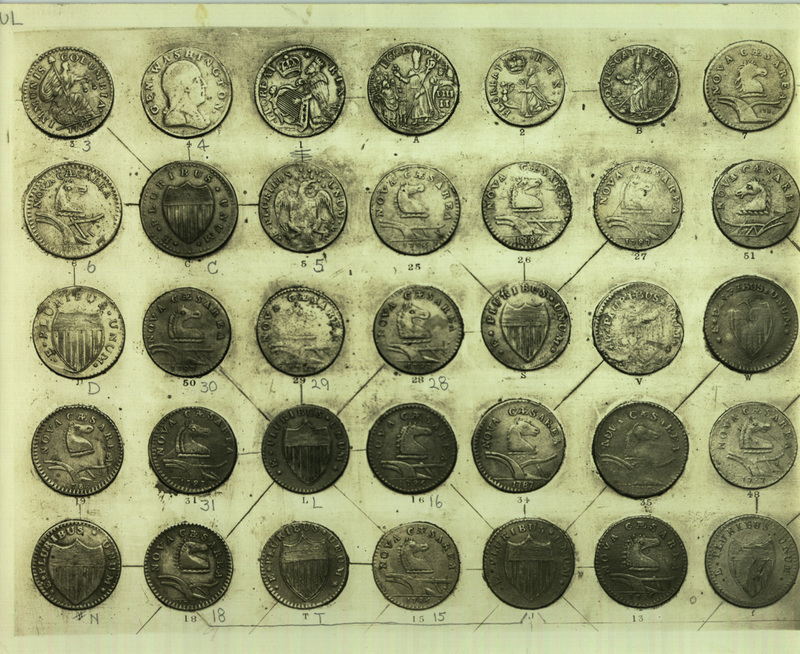 Another version of the 1965 Vlack plates from The Colonial Newsletter Foundation Photofiles provided by Jim Spilman. 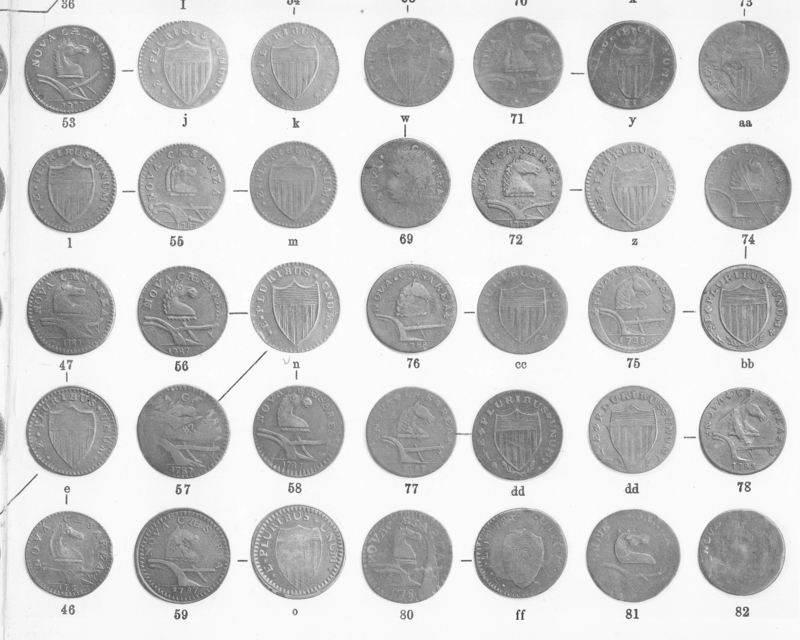 The following charts created by Robert Vlack in 1961 were produced from negatives in The Colonial Newsletter Foundation Photofiles and were provided by Jim Spilman. 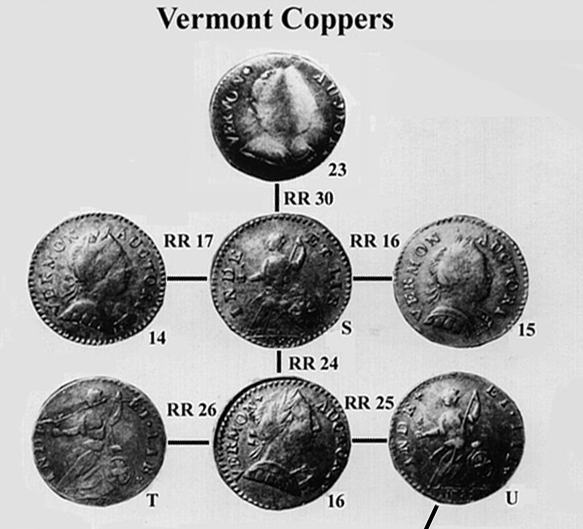 Variation designations are by Robert Vlack consisting of obverse numbers and reverse letters. 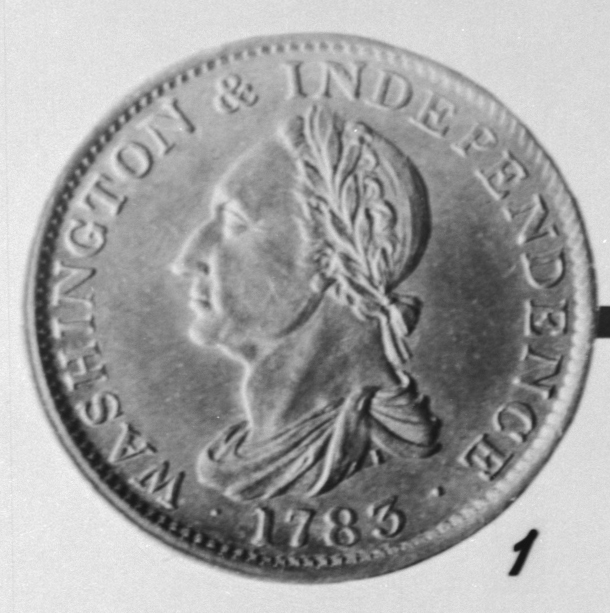 The charts are presented as clickable 125 dpi jpg images. 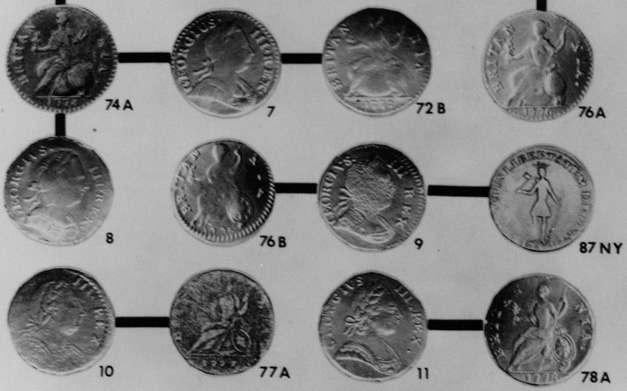 For fast downloading the upper and lower portions of each chart are also offered seperately. 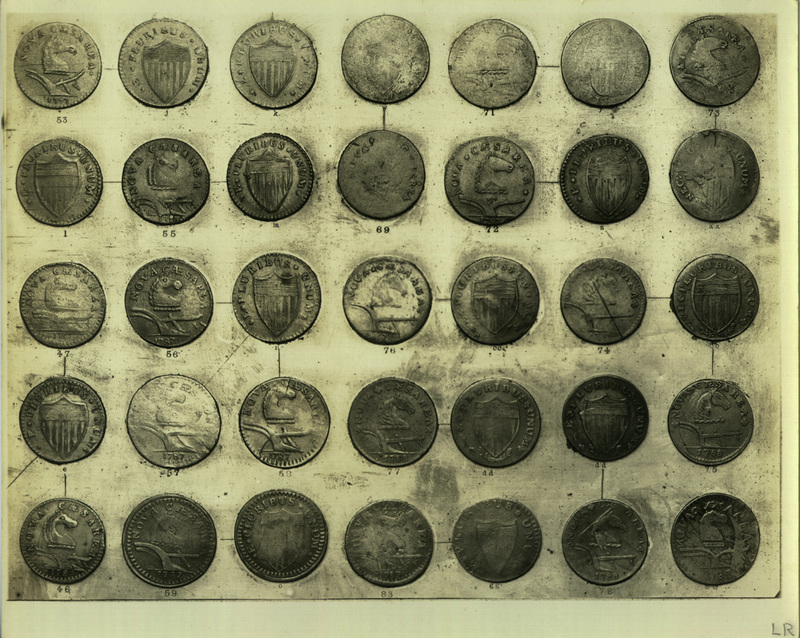 The individual obverse and reverse varieties are also presented as 500 dpi images. 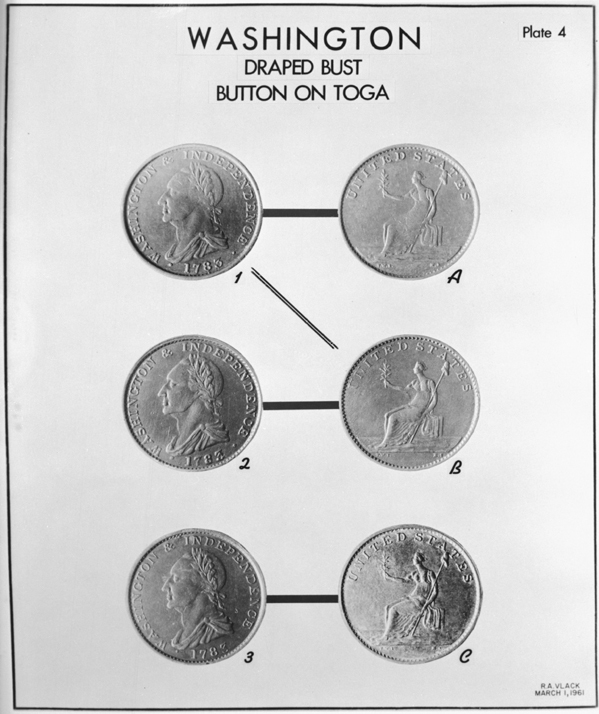 Click here for the Washington Draped Bust, Button on Toga varieties. 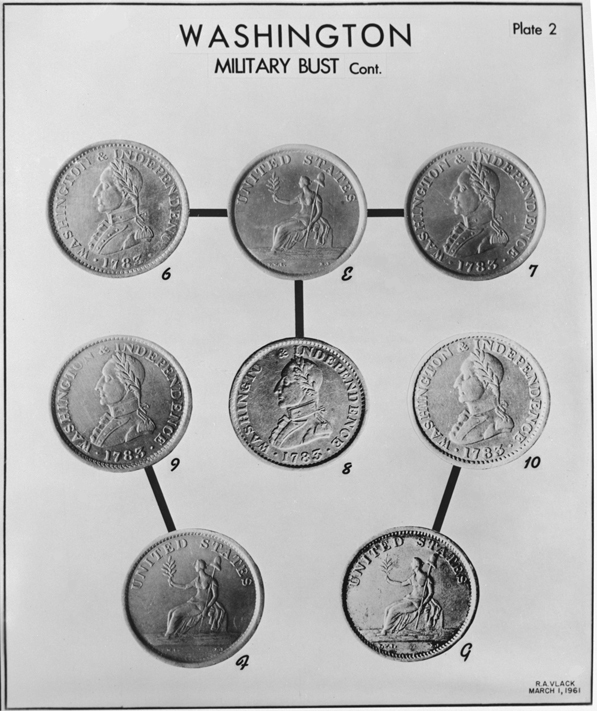 Click here forWashington Military Bust Varieties - Plate 1. 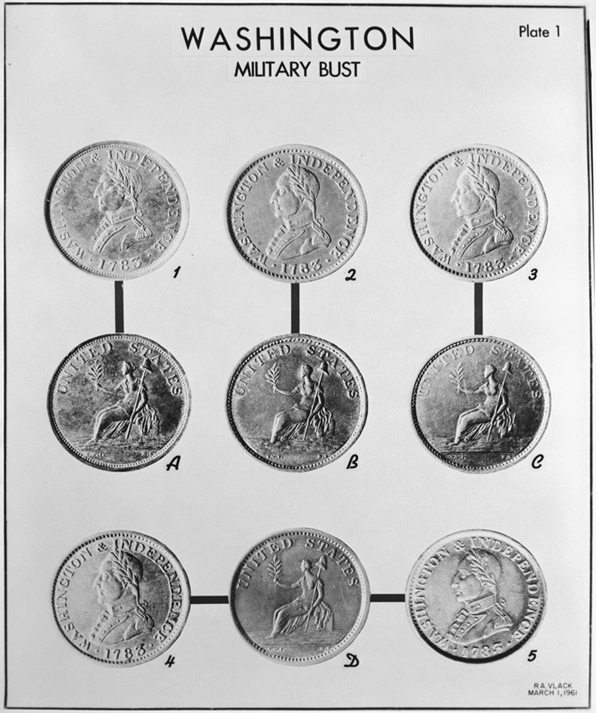 Click here forWashington Military Bust Varieties - Plate 2.